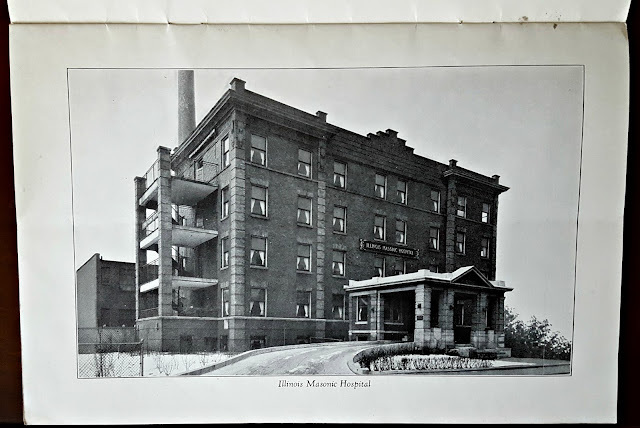 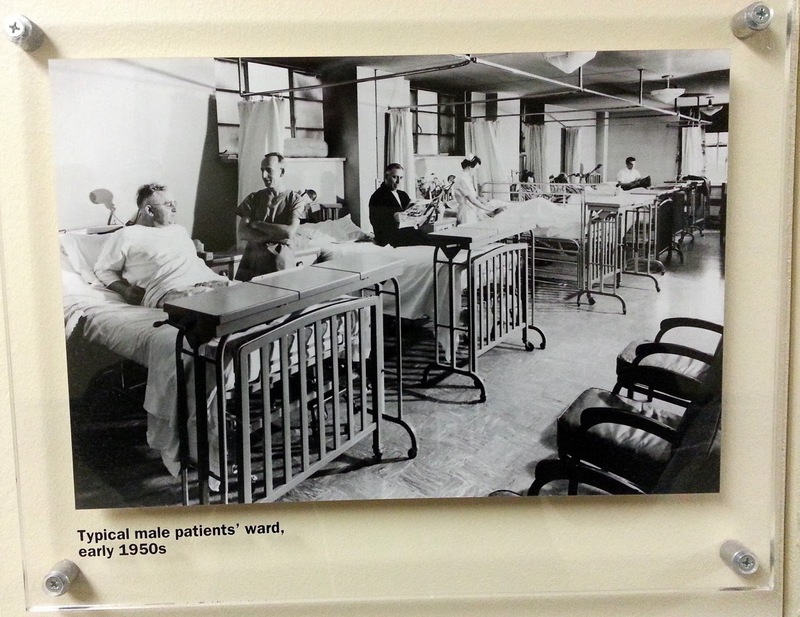 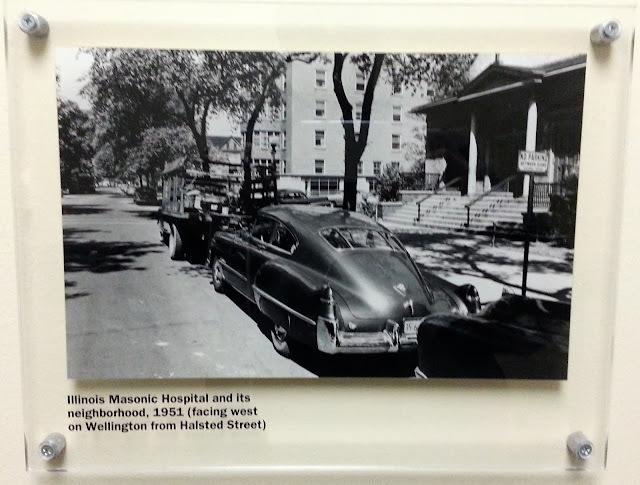 The history of Chicago's hospitals began with an almshouse; a type of health care facility established by Cook County as part of its responsibility to provide care for indigent or homeless county residents and for sick or needy travelers. 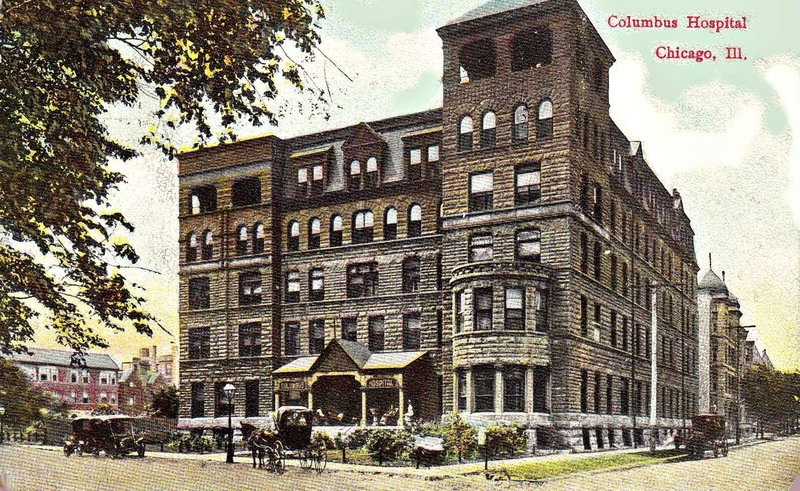 This building was located at the corner of Clark and Randolph streets. 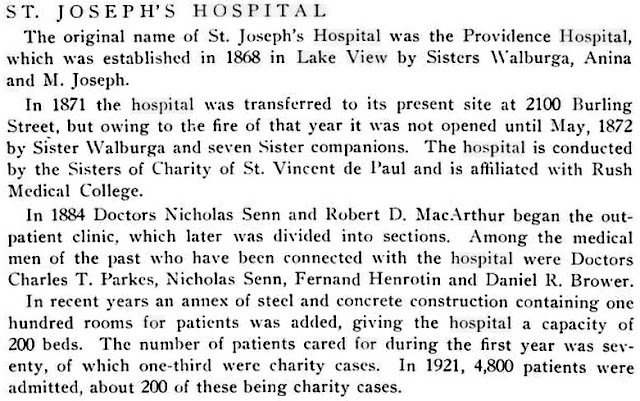 This public charity operation was established as early as 1835. 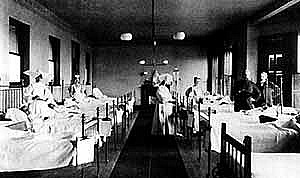 It did provide medical assistance but such places like this one typically crowded the ill together with the healthy poor, the insane, and persons who were permanently incapacitated. 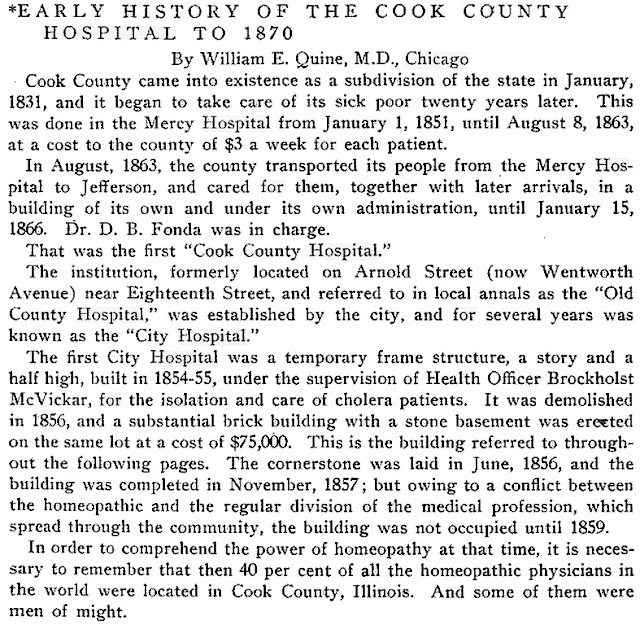 Unlike the Cook County, the City of Chicago had no legal mandate to care for the sick poor, but its charter did charge it with guarding against “pestilential or infectious diseases.” Cholera had hit the area in 1832, and smallpox and scarlet fever were familiar to many years before that time period. 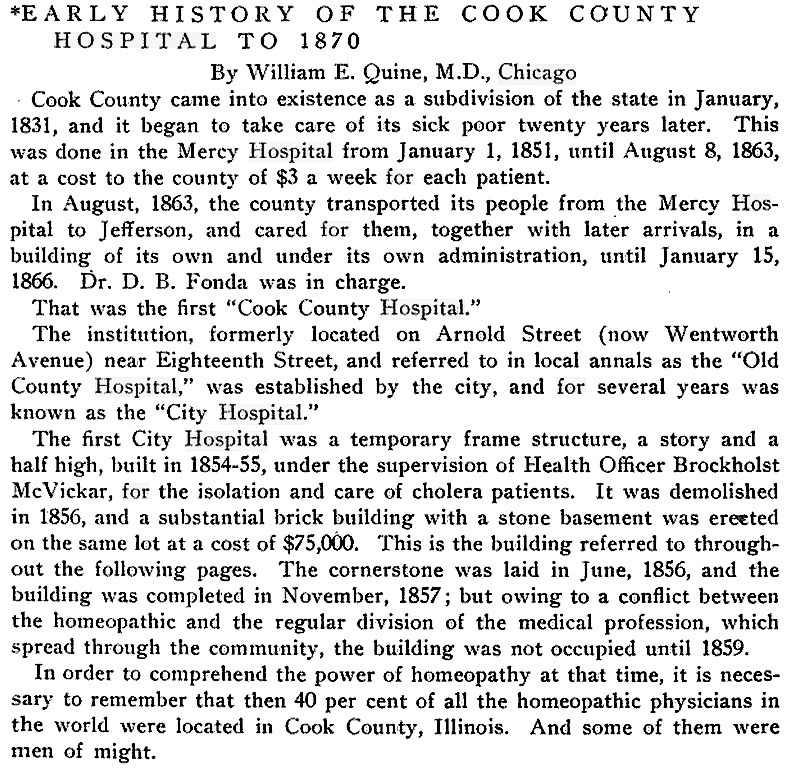 By 1843 fear of cholera prompted city officials to build the first institution devoted exclusively to medical care in Chicago, a small wooden structure located on the far northern border of the city. Ironically, it was built on land bought for a cemetery. 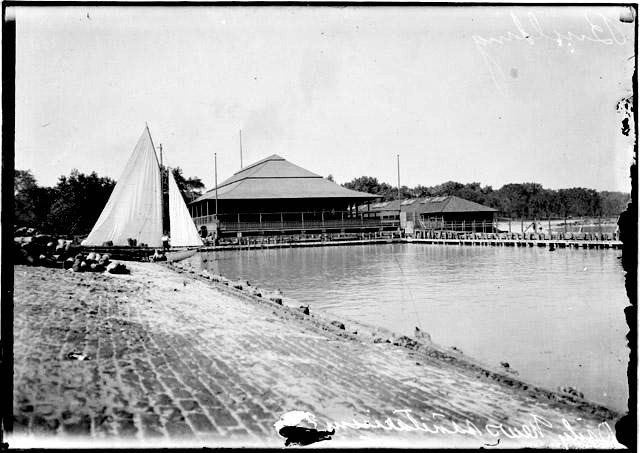 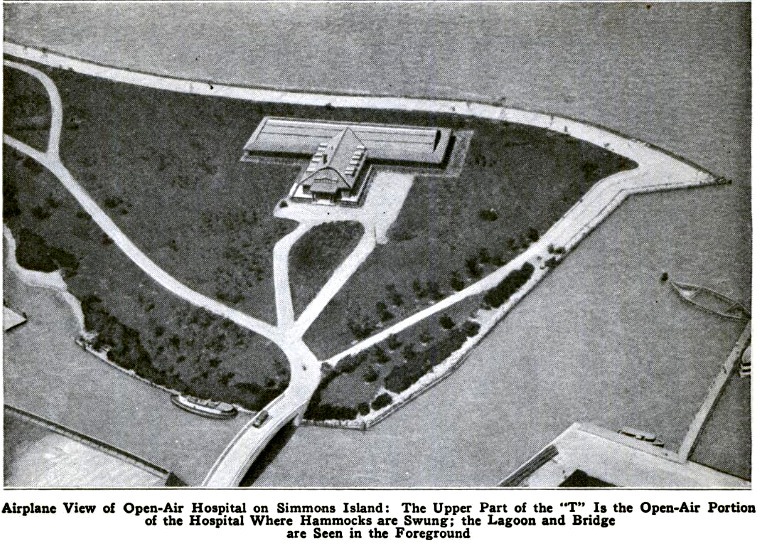 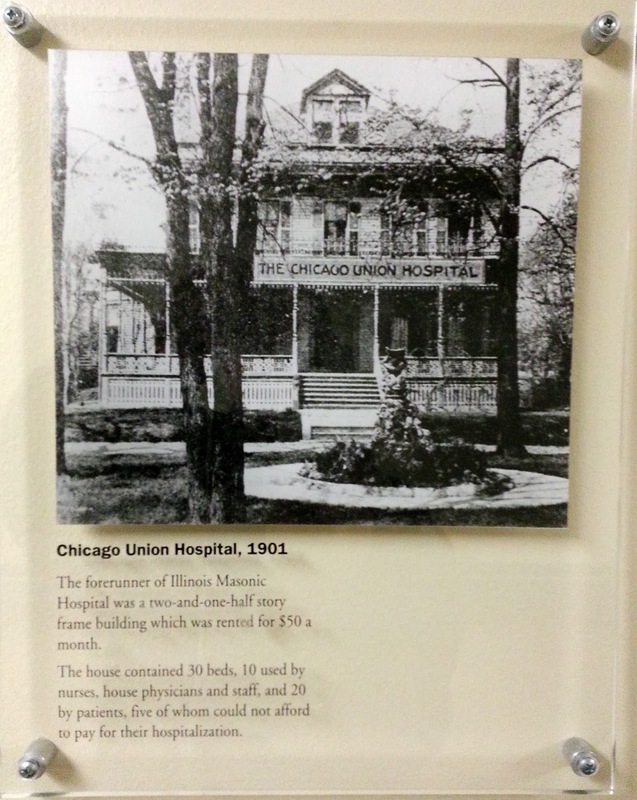 This first hospital [was a] frame structure the was rebuilt in 1852 at North Avenue and the lakefront was designed to keep victims of contagious disease away from the center of population. 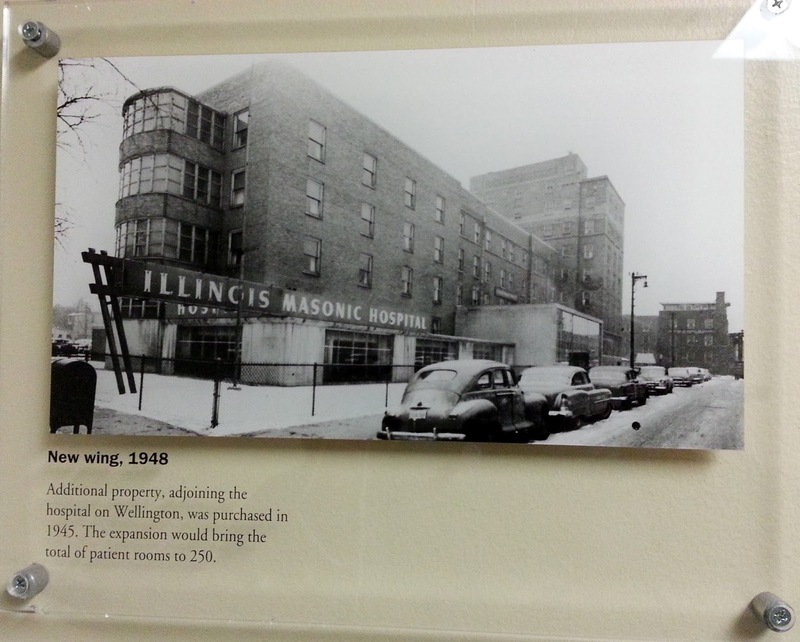 - Illinois Trails & Encyclopedia of Chicago. 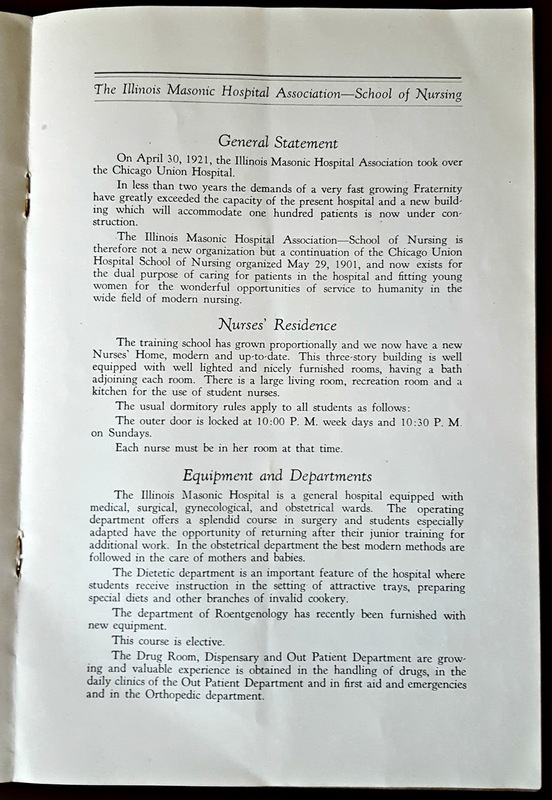 History of Medicine and Surgery of 1922. 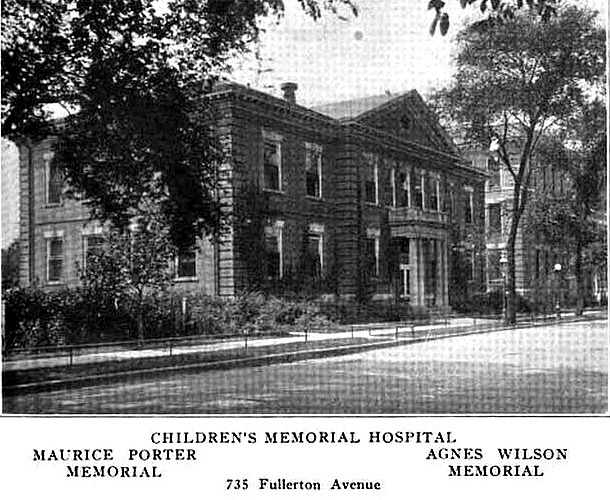 Built in 1886 originally located at 817 Diversey Boulevard and then shortly moved to its last location at 741 Diversey Boulevard. 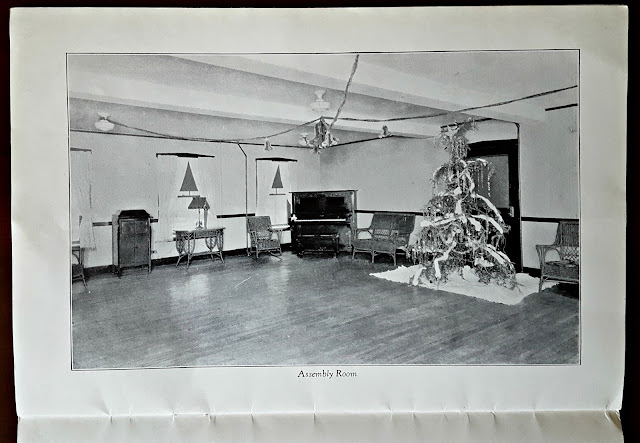 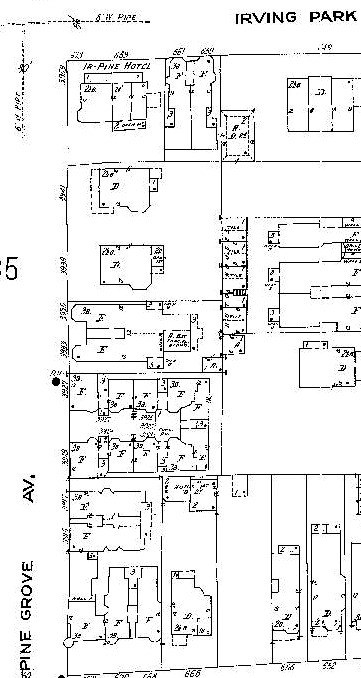 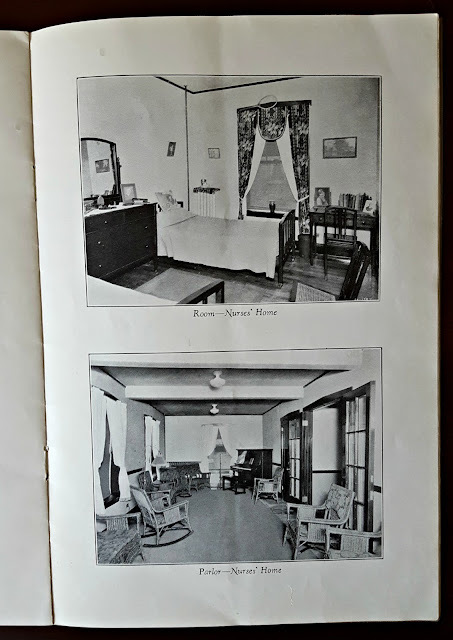 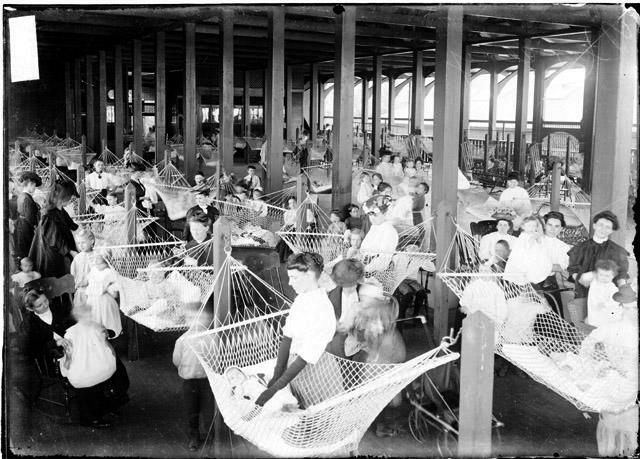 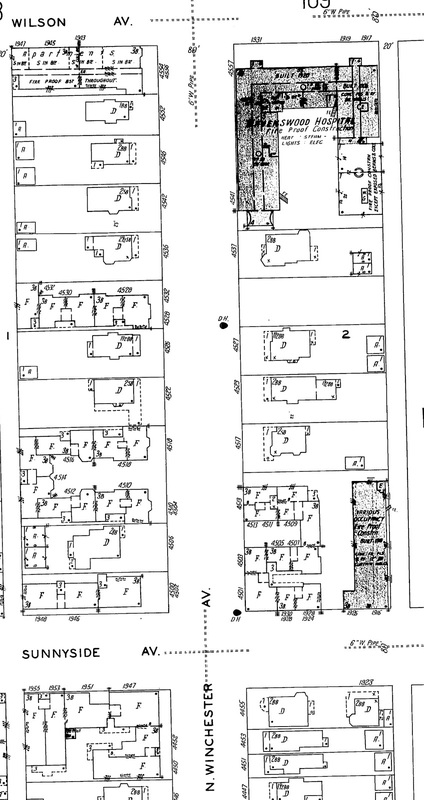 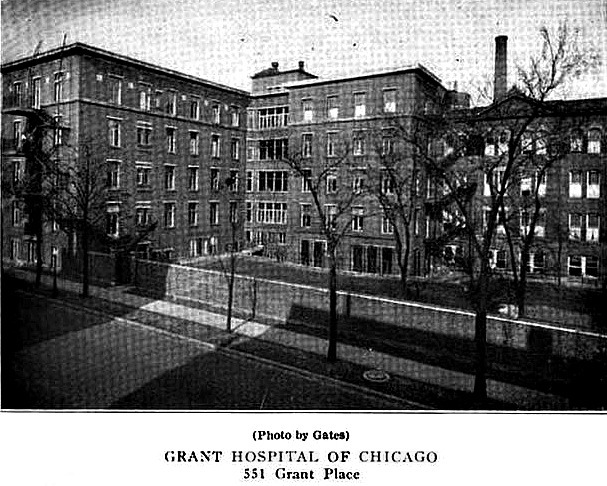 This 60 bed private facility mostly served the German American residents in a area. 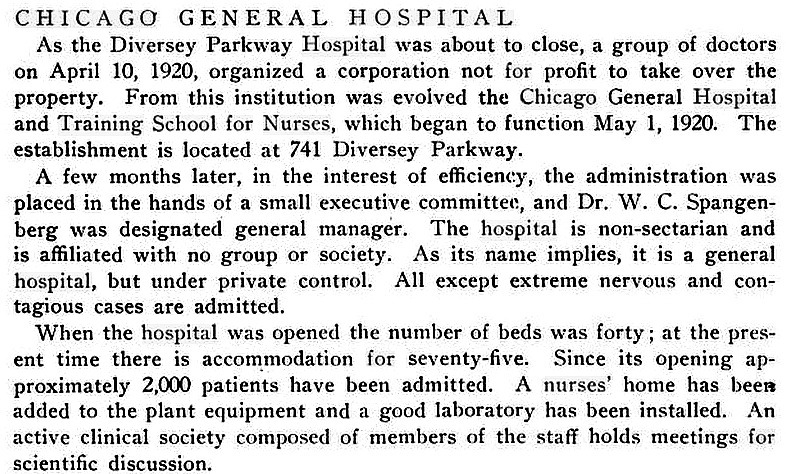 By 1920 this hospital was renamed Chicago General Hospital. 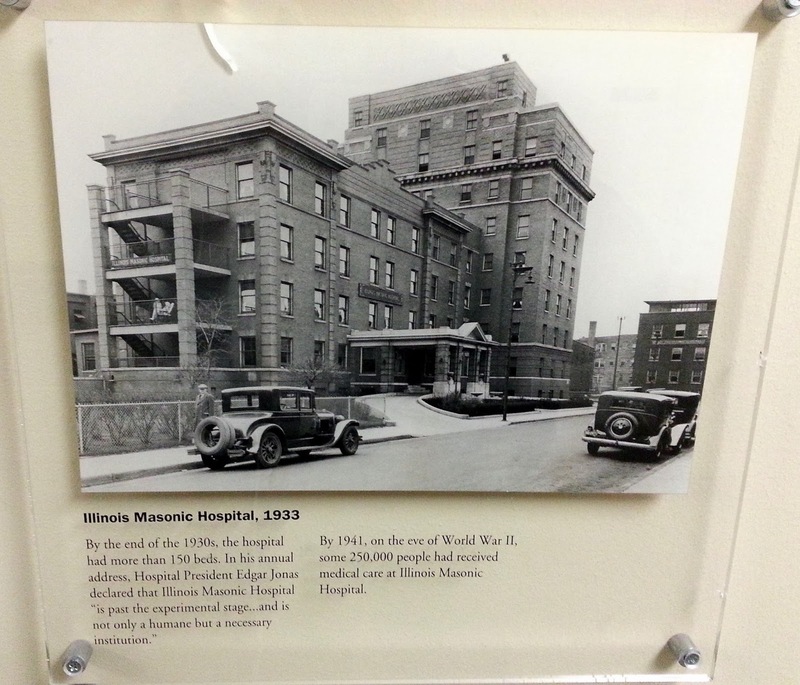 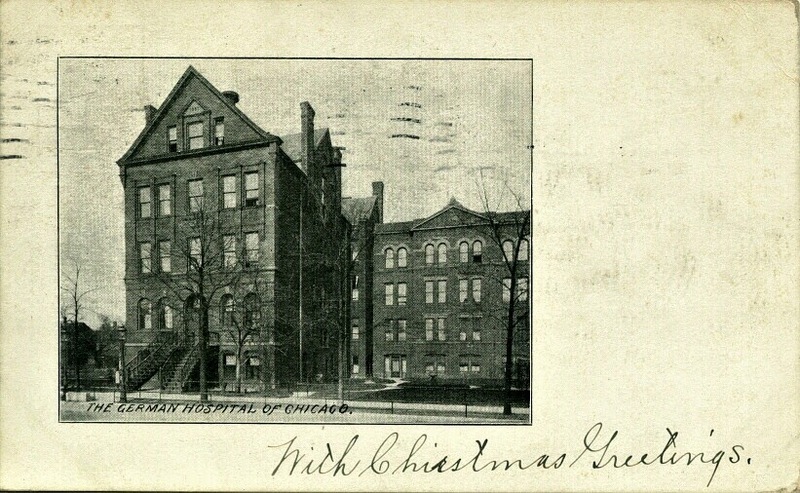 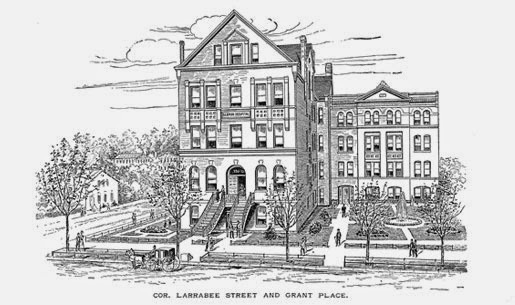 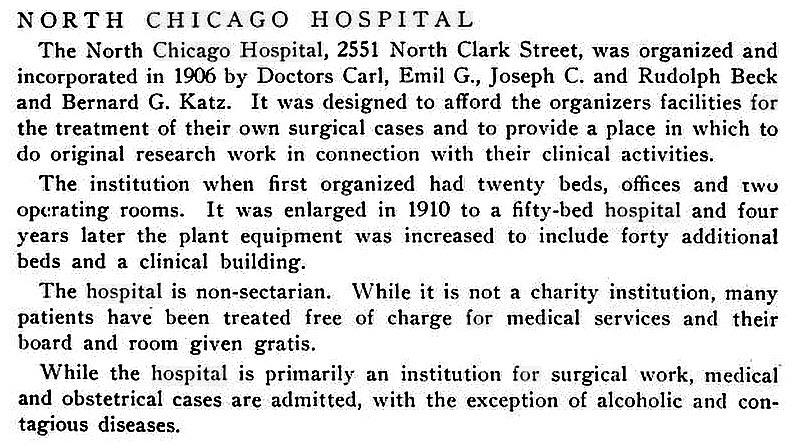 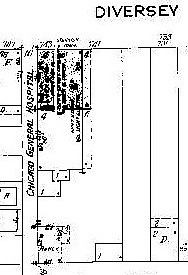 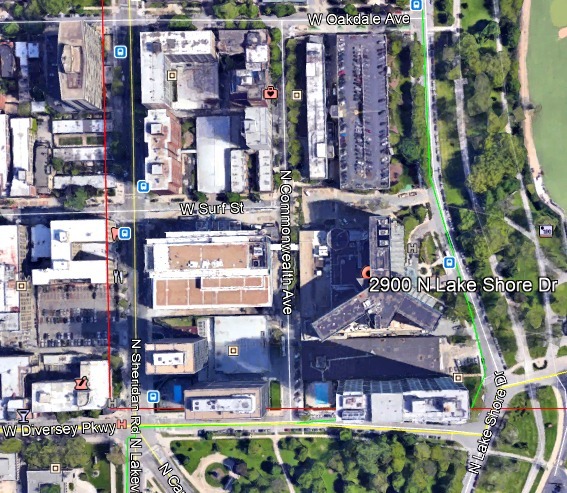 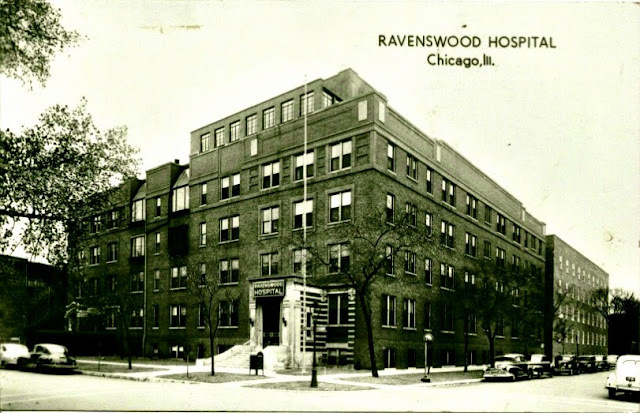 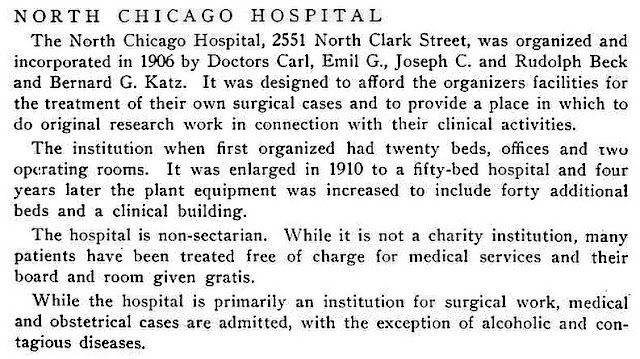 This hospital is a by-product of an earlier hospital called The German Hospital of Chicago that was located on Larabee and Grant in 1883 squarely within the City of Chicago, at that time.The hospital was to be later renamed Grant Hospital during the anti-German years of World War I. 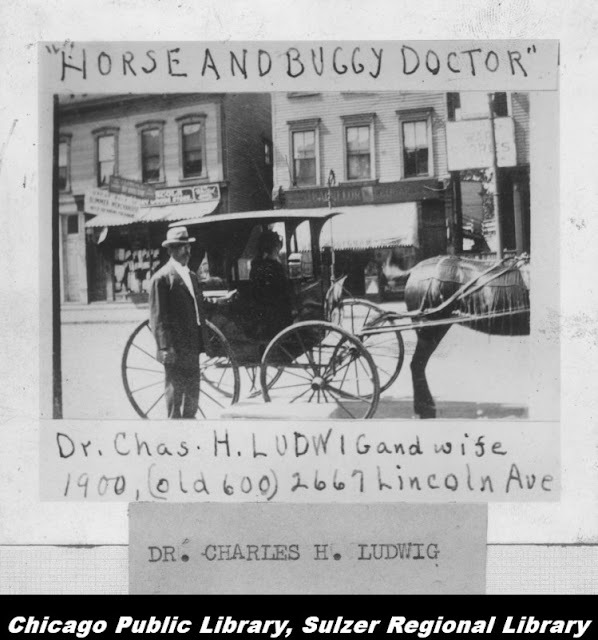 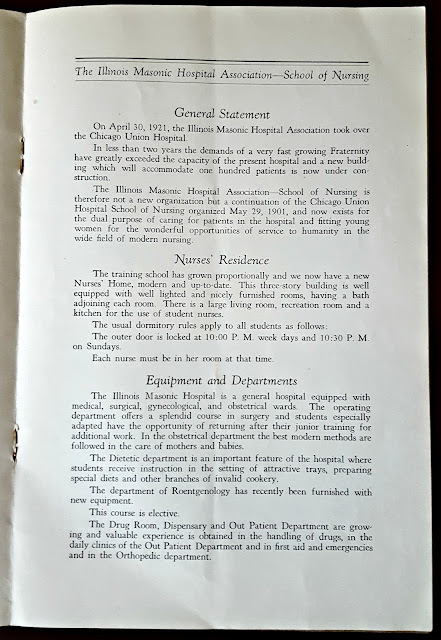 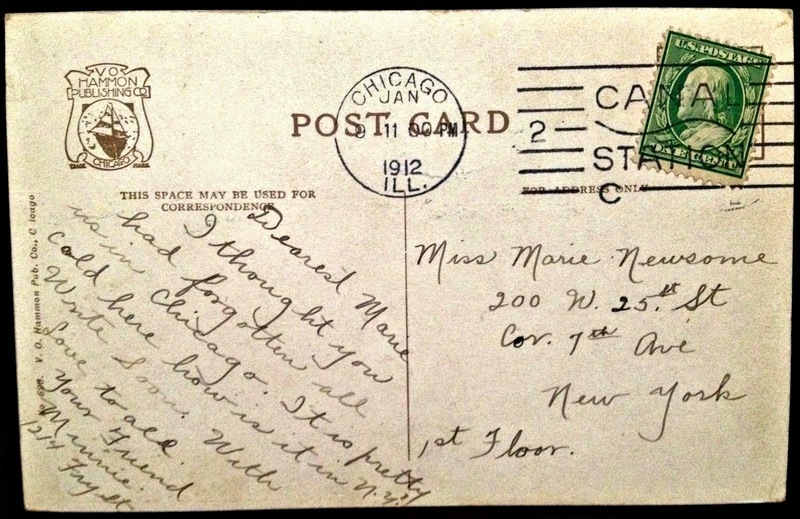 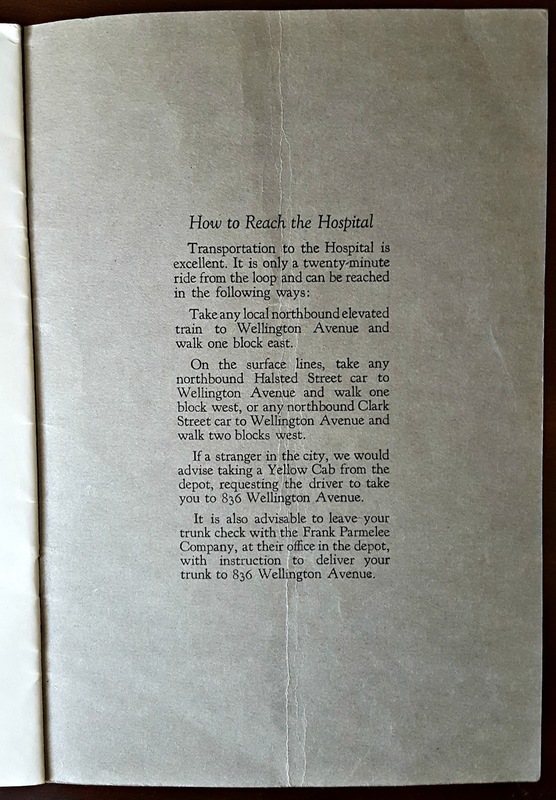 The link between the two different hospitals was a man named Harry J. Haiselden who once served as a 'practicing resident' at German Hospital of Chicago to be later serve, after a couple of years, as chief surgeon at the German-American Hospital by 1915. 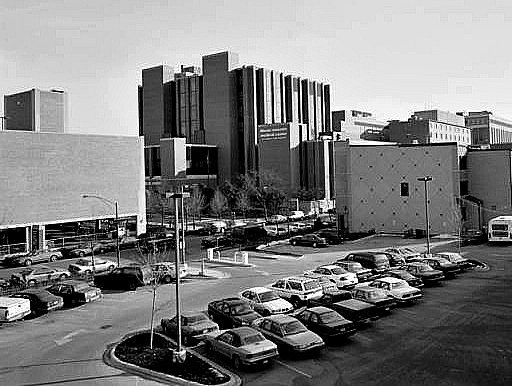 Mr. Haiselden is important in this tale of hospital linkage due to the decision he made that create a firestorm of debate in the medical world and in public opinion. 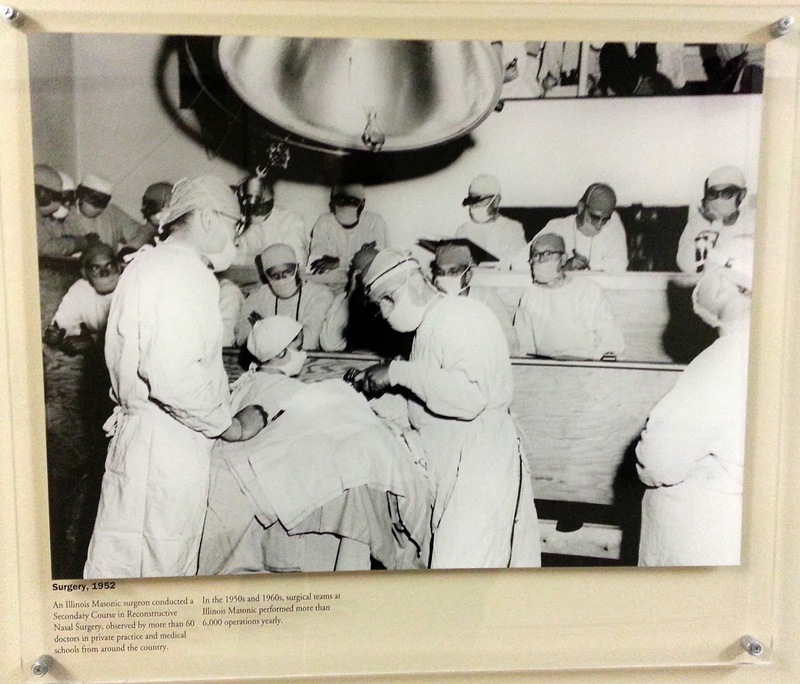 As chief surgeon he repetitively refused to perform needed surgery for children born with severe birth defects and allowed the babies to die, an act of eugeics. 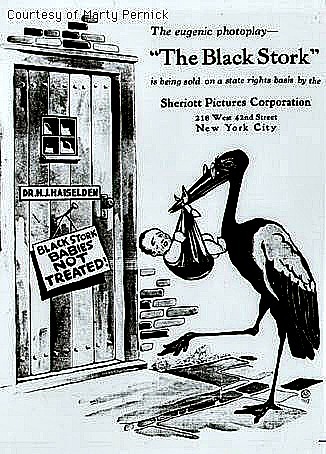 A silent film was produced from this debate called The Black Stork in 1917. 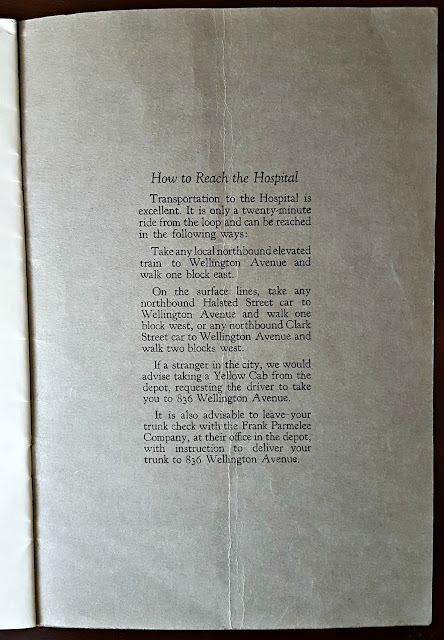 There is a YouTube video of it provided here. 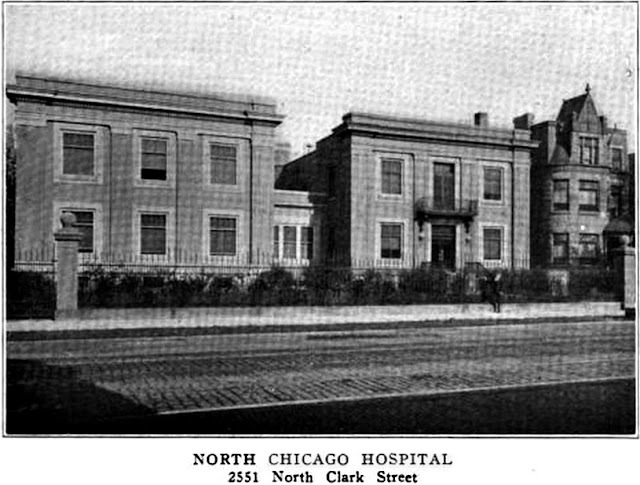 Built by 1910 located on the northwest corner area of Montrose and Clarendon Avenues. 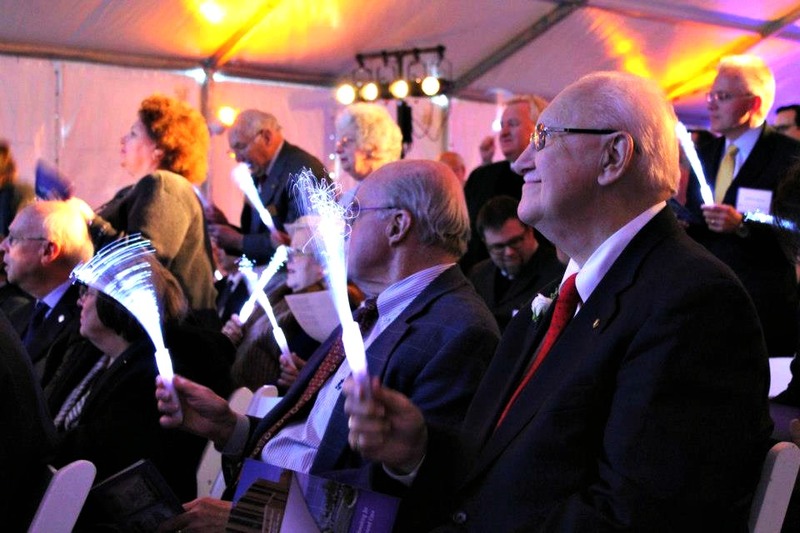 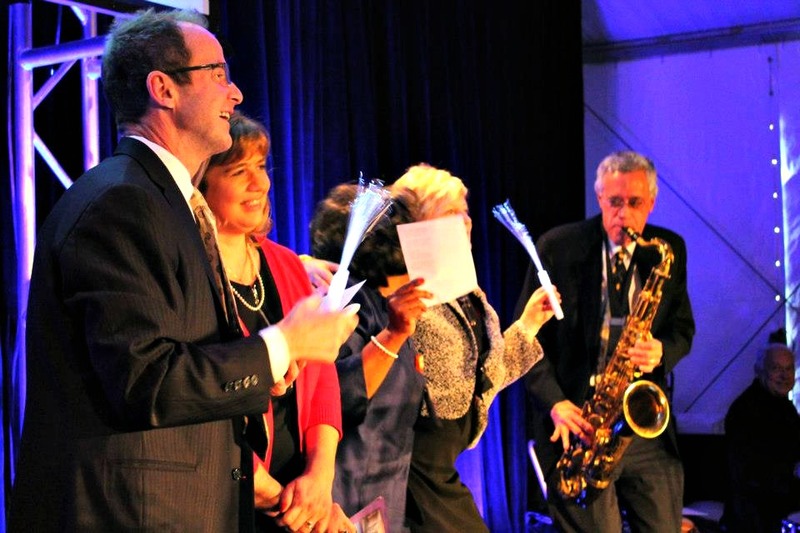 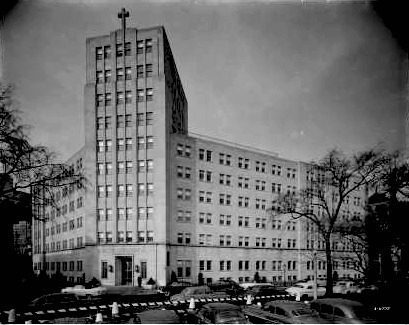 Frank Cuneo, Jr. donated the hospital building to Missionary Sisters of the Sacred Heart of Jesus, an organization founded by Mother Francis Xavier Cabrini, a saint in the Roman Catholic Church. 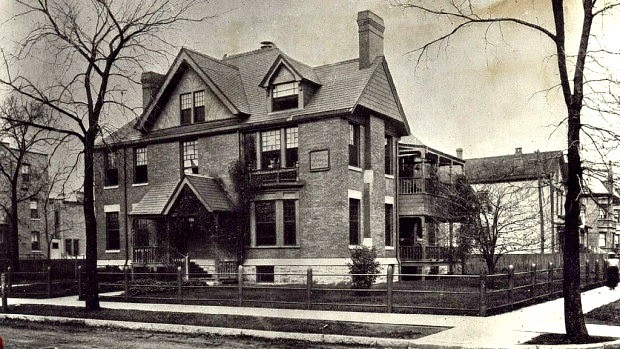 4420 Clarendon Avenue in the Buena Park neighborhood of the community of Uptown. 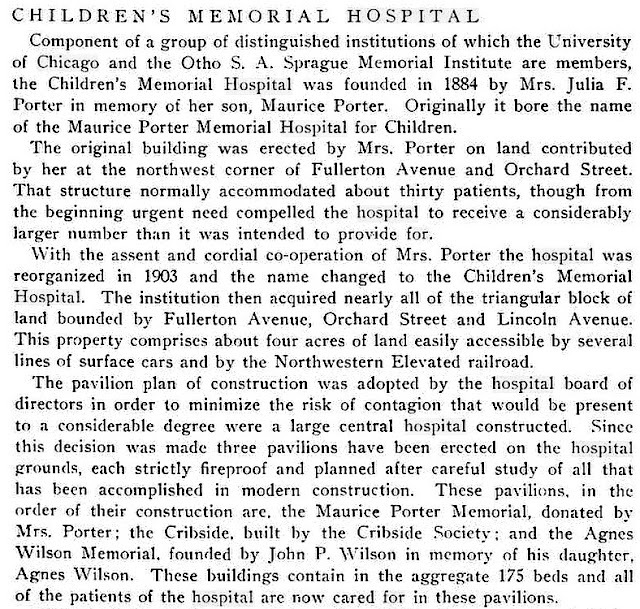 The hospital was dedicated to the health and well-being of children. 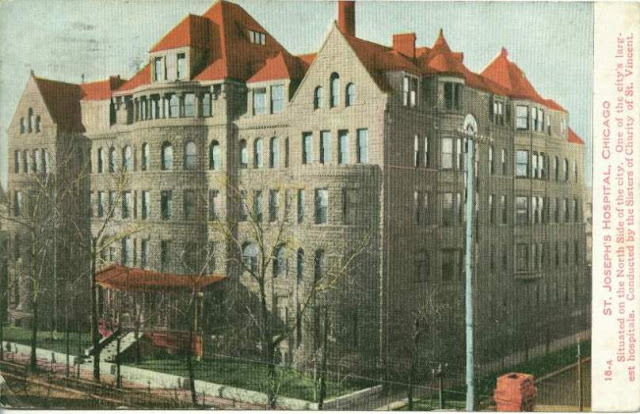 The administration building was across the street from the hospital. 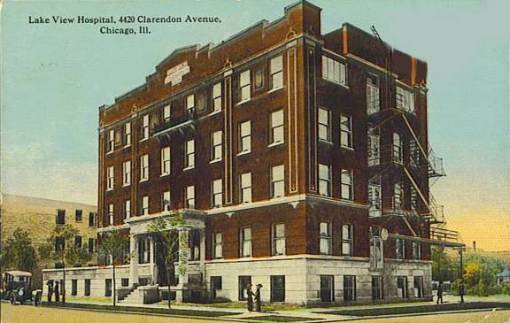 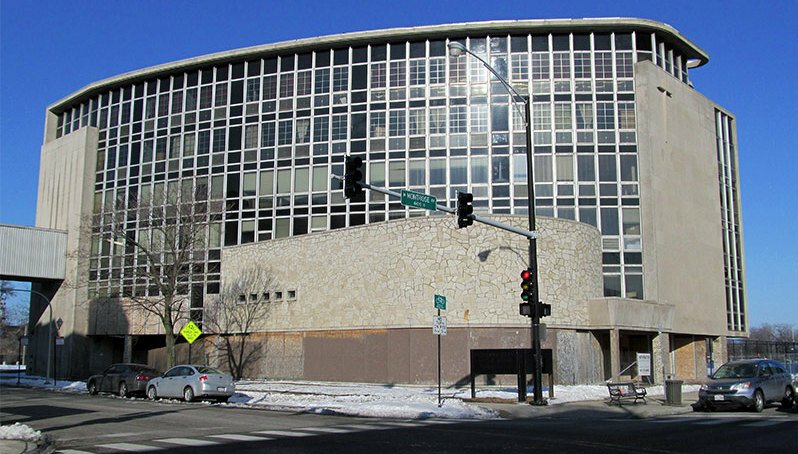 The hospital was listed on a preservation list in 2012 - Chicago Preservation. 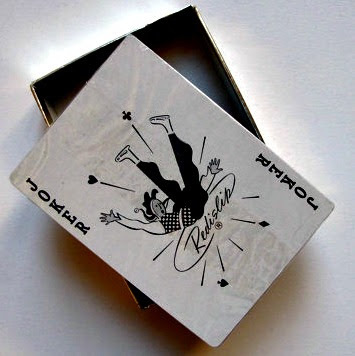 I have a Facebook album on it. 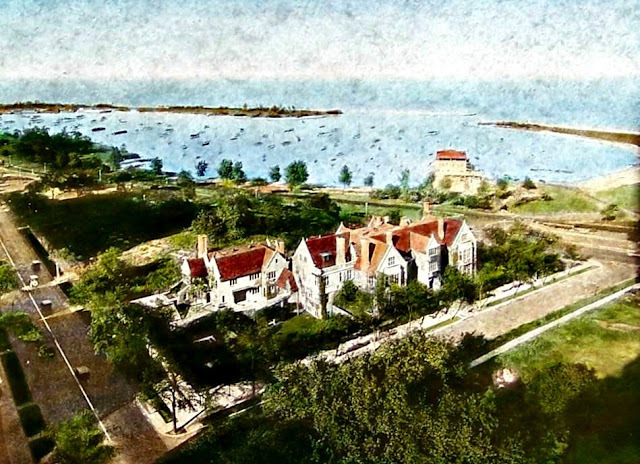 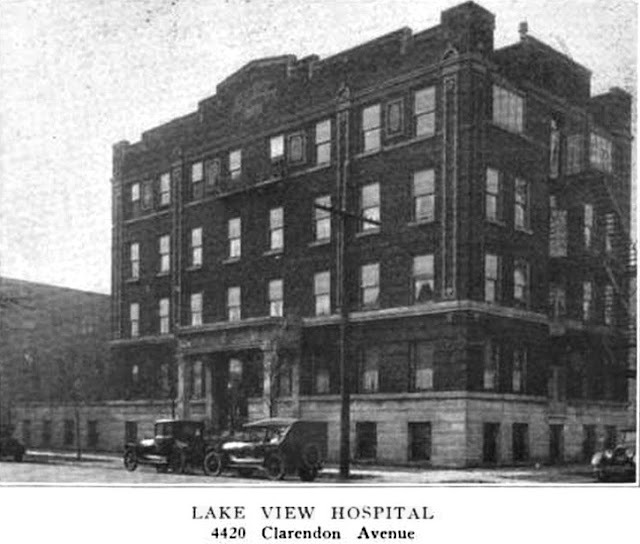 The original building was constructed in 1890, nearly two years after the City of Lake View was annexed to the City of Chicago. 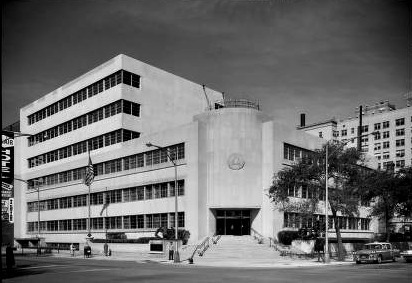 It was located on the southeast corner of Deming and Lake View Avenue. 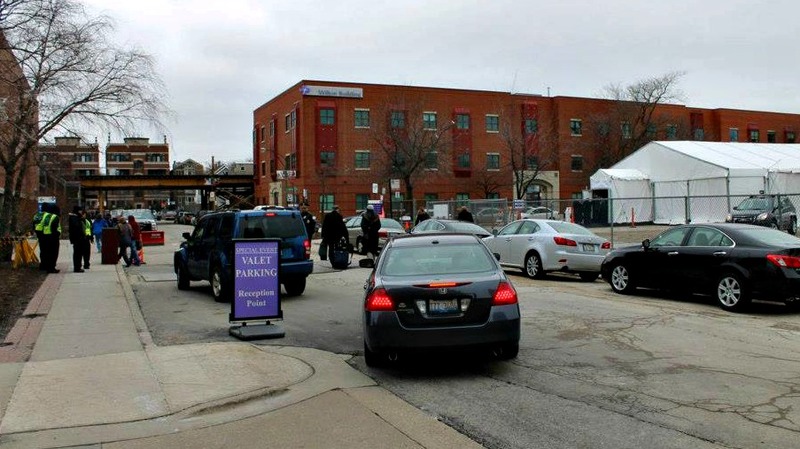 a variety of services before its closure. 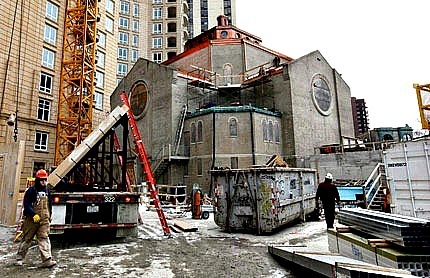 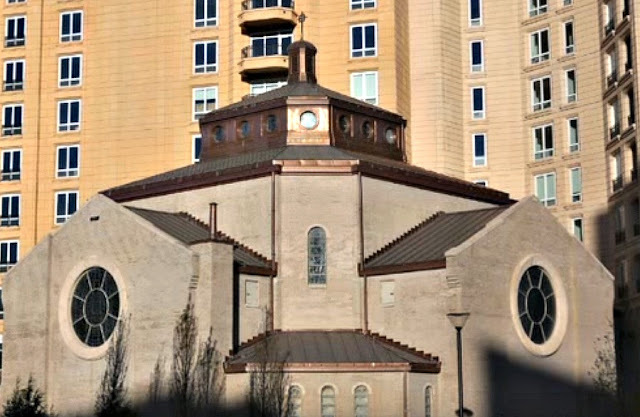 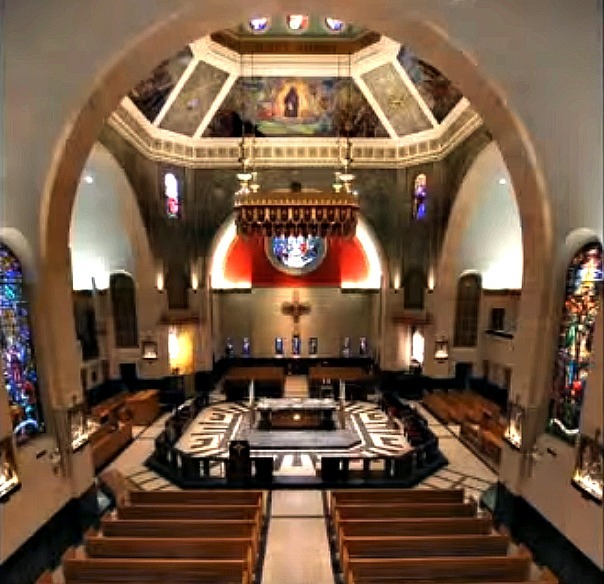 By 2001 the hospital was sold to a developer who had a interesting issue - a shrine that was built in the middle of the hospital that was dear to the Catholic faithful. 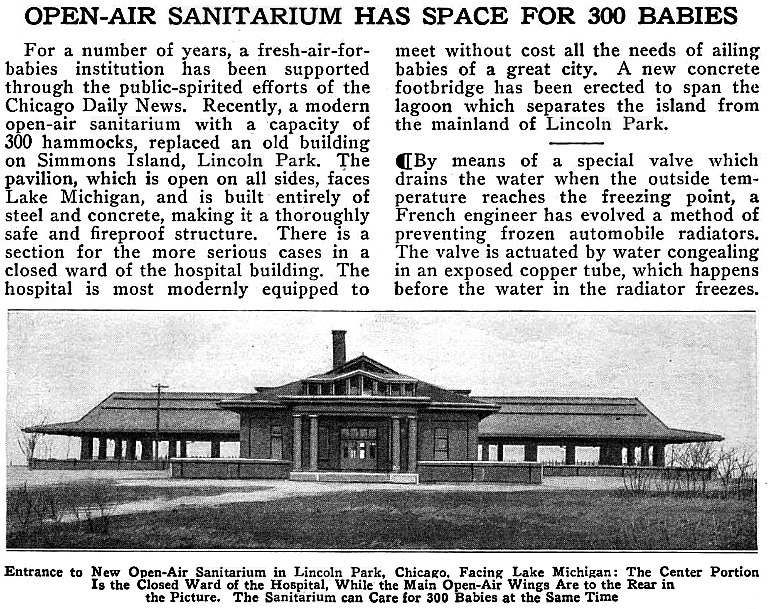 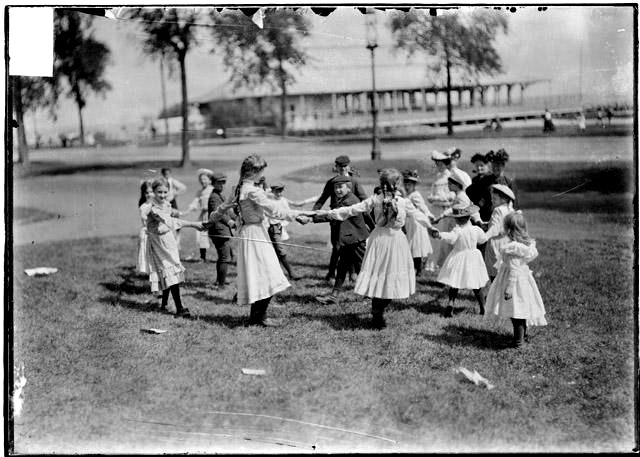 I contend when the Lincoln Park Sanitarium became Columbus Hospital the Chicago Daily News decided to build and open their own sanitarium along the newly land-filled area of Lincoln Park, the park. 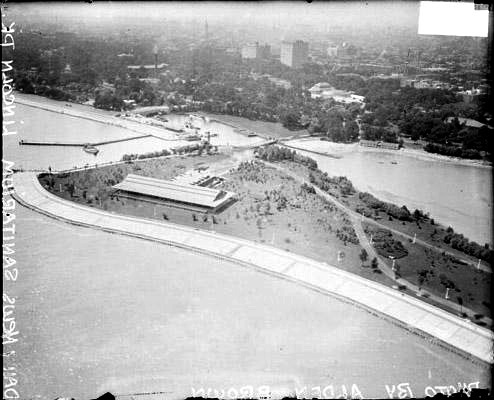 By the time of its construction the park only reached to Cornelia Avenue. 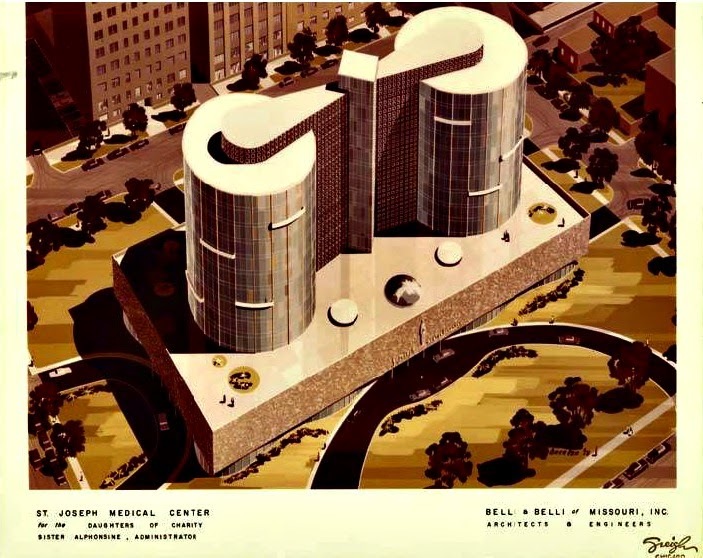 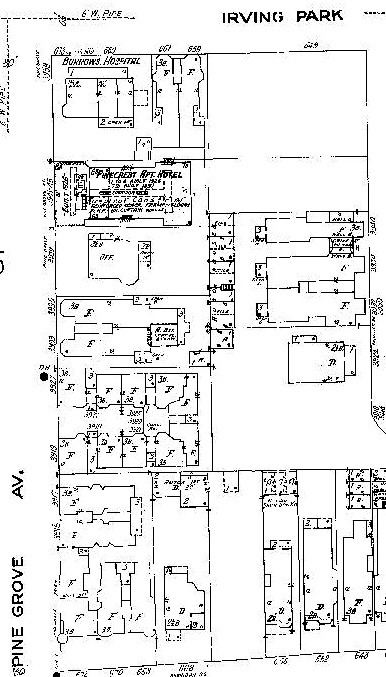 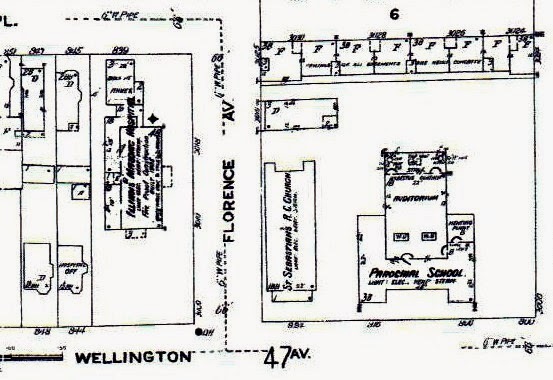 This hospital struggled with zoning and federal tax issues from 1944 to 1955. 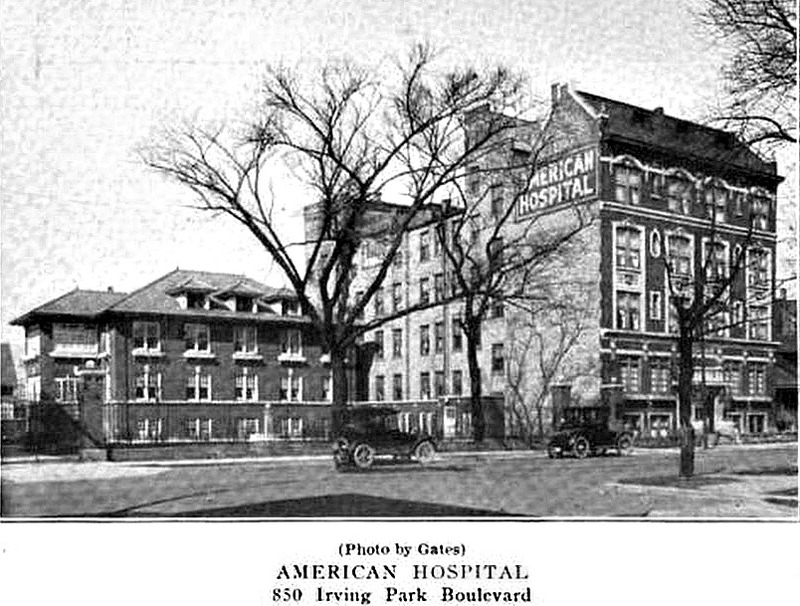 This hospital was rezoned and later converted from an old stately mansion estate/hospital to high-rise residential living. 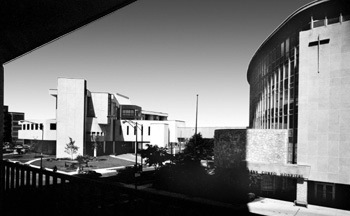 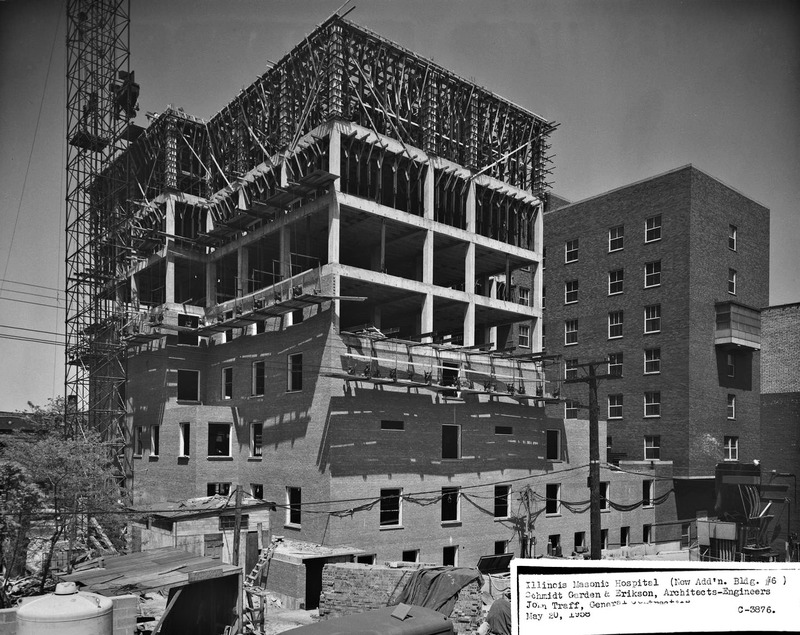 All the buildings within the concrete wall was razed by 1959. 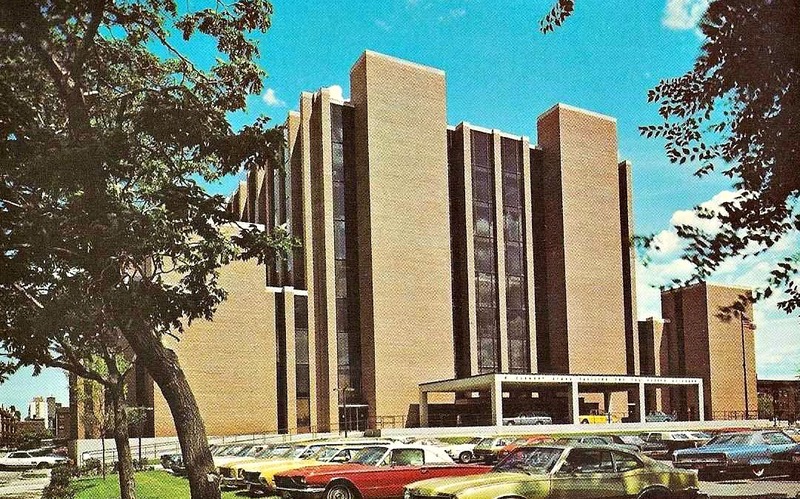 This hospital had a bright future and then suddenly an unforgiving end. 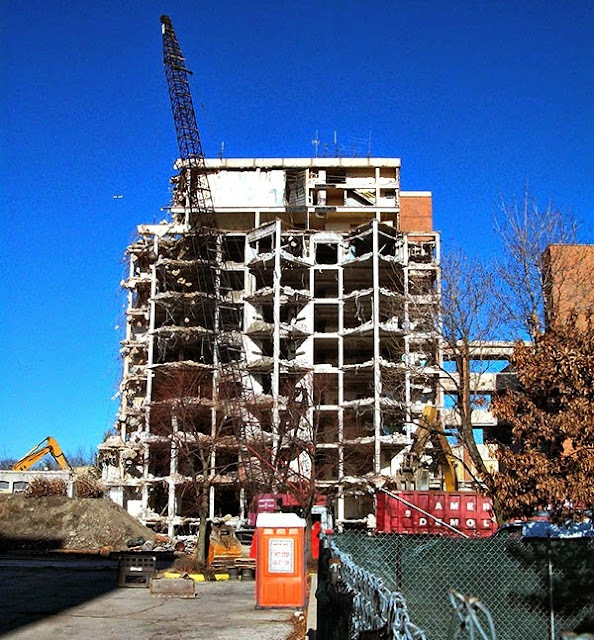 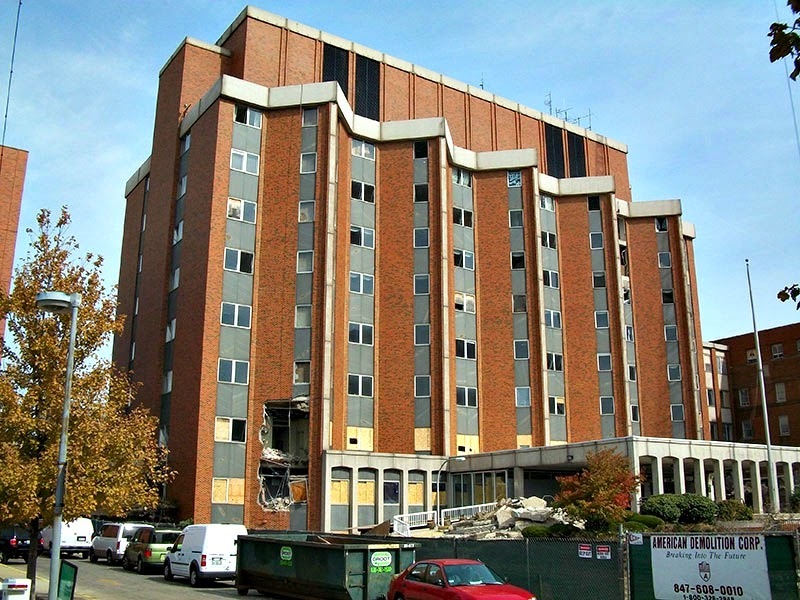 View the articles and links below about its history that finally resulted in its demolition. 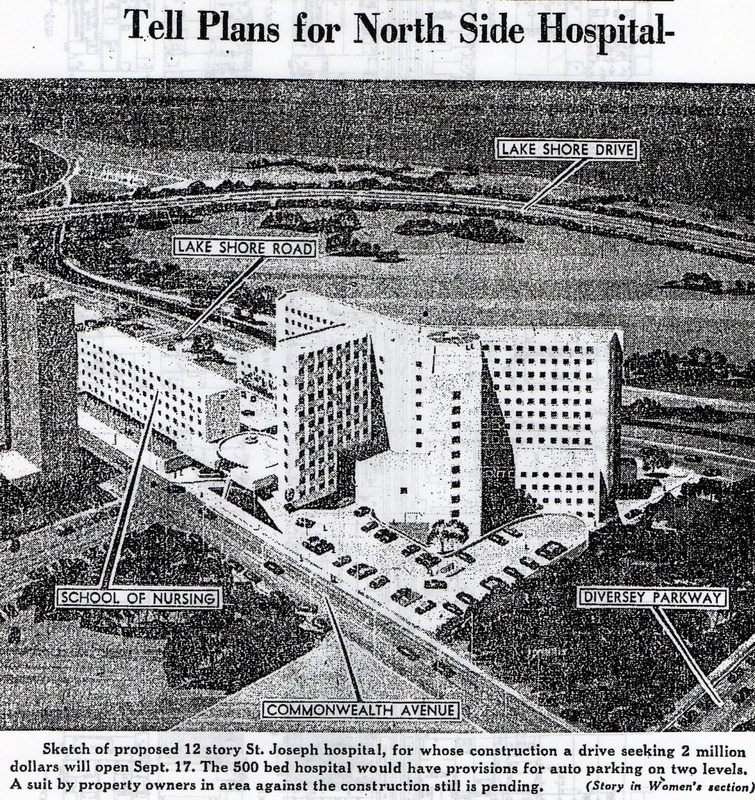 2002 the hospital was to be sold and a decade later to be demolished due to vacancy and neighborhood complaints. 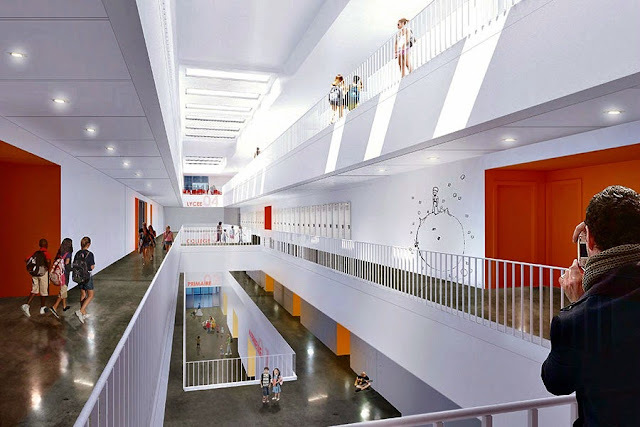 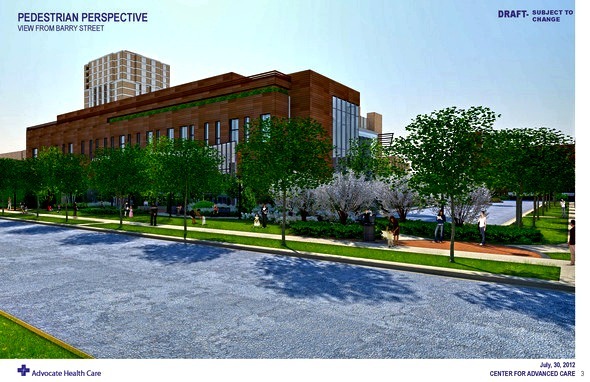 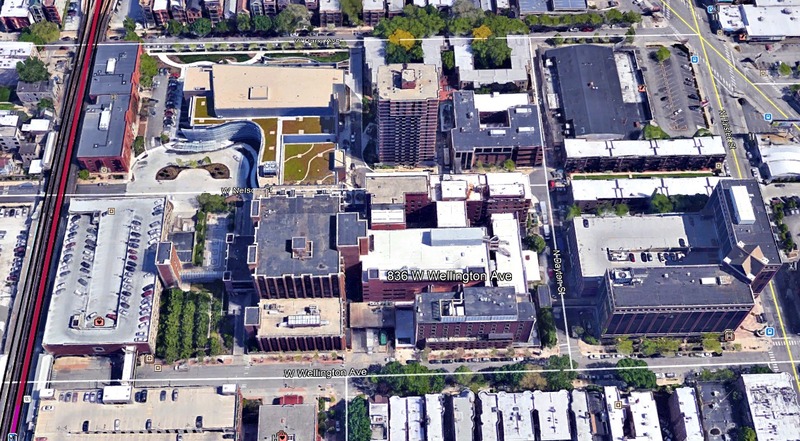 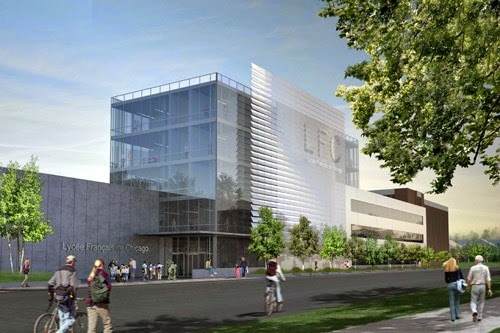 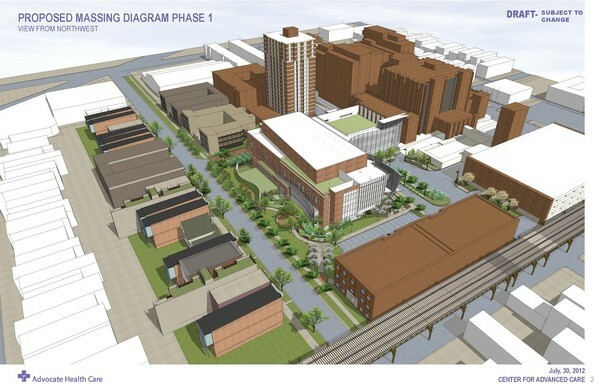 By 2014 a school replaced the building space that was once a still engaging hospital that serve the needs of the greater Ravenswood community area. Dr. Samuel Burrows founded the Burrows Hospital and held the title of head surgeon. 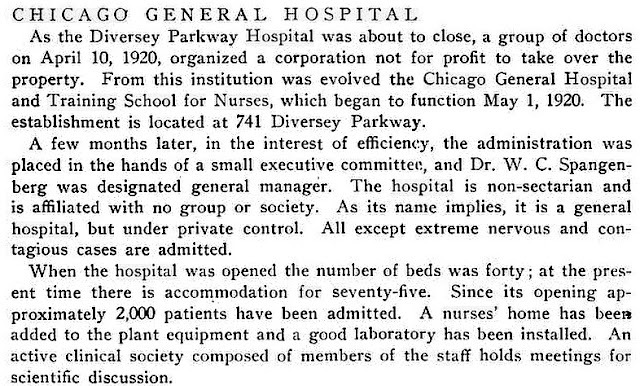 The hospital was established in 1927 and apparently closed by the mid 20th century. 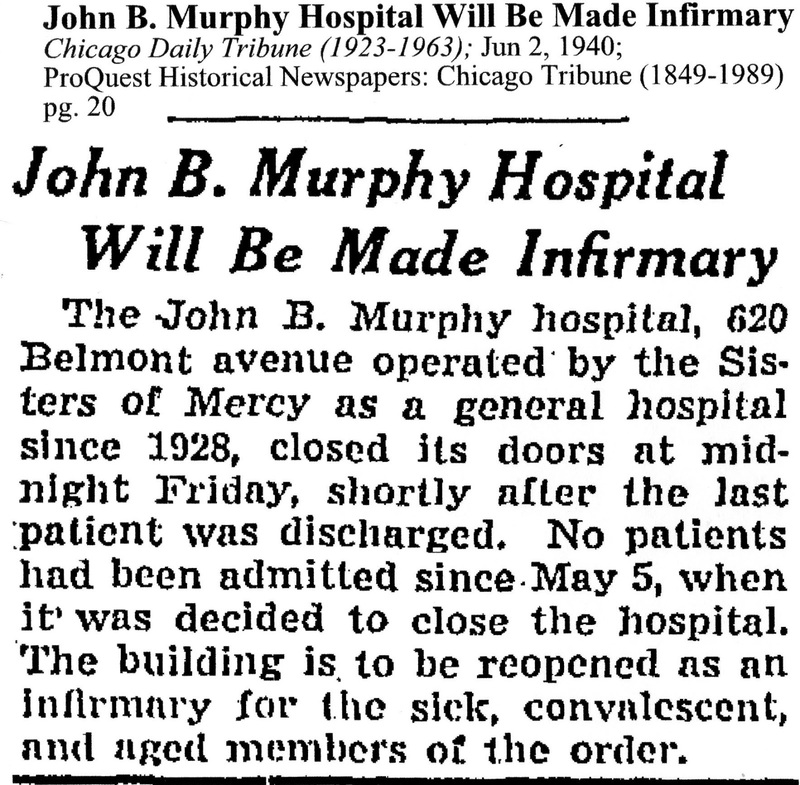 According to a 1930 Chicago Daily News article his father Thomas (retired?) 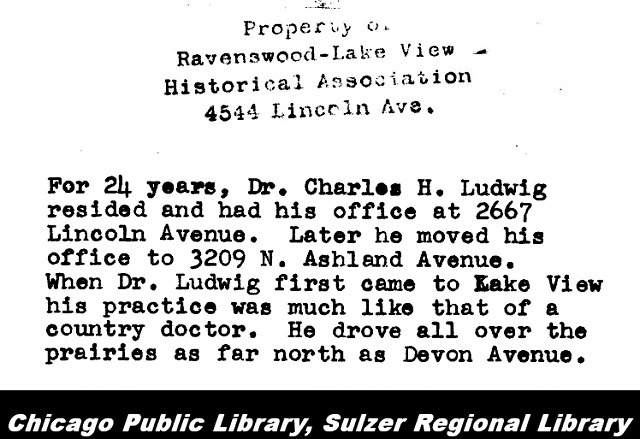 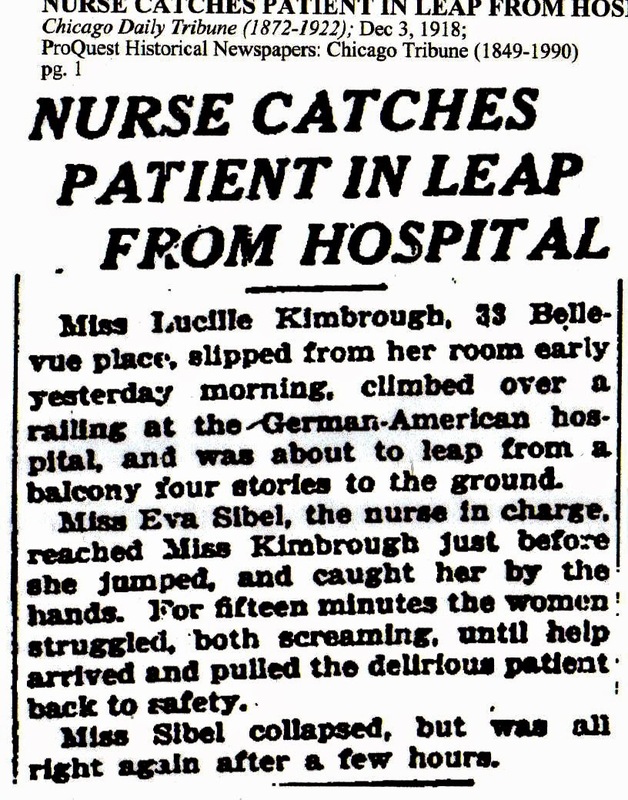 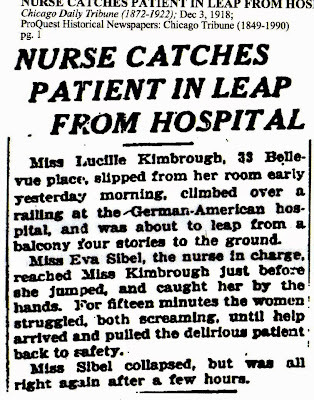 was also a doctor who resided in the same hospital, former hotel, til his death in September 1930. 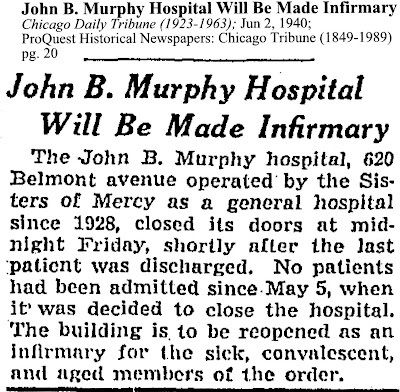 This training hospital was named after John Benjamin Murphy who advocated his professional life in the treatment of appendicitis to prevent complications. He performed one of the first operations in early acute appendicitis in 1889. 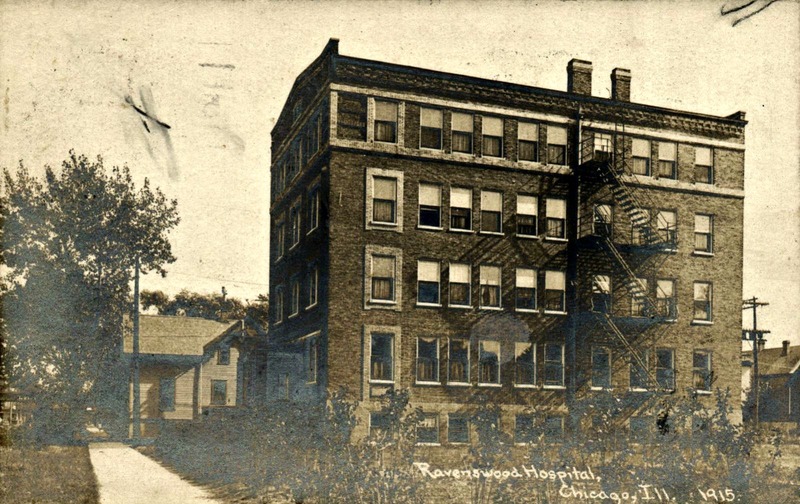 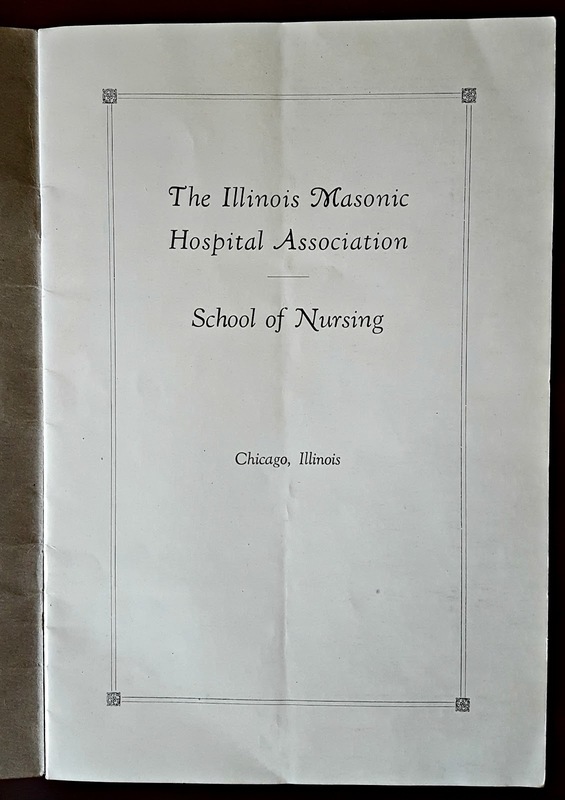 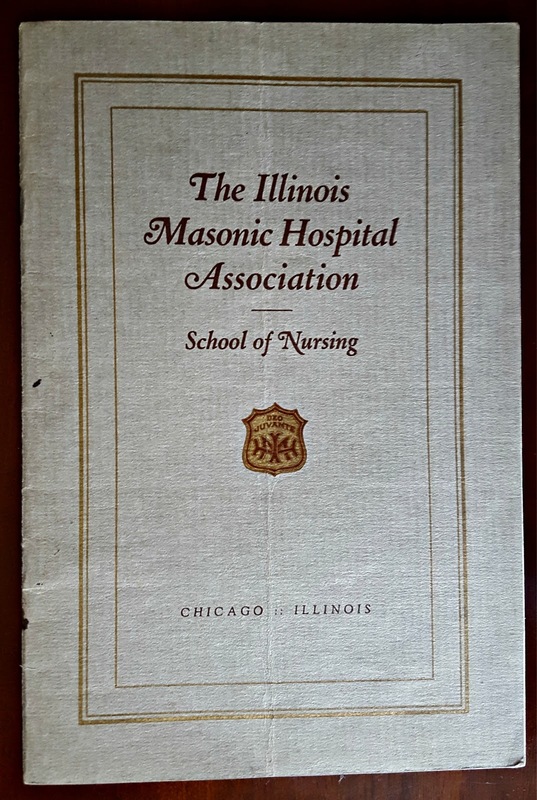 Once located at 628 W Belmont Avenue the 'Lake View Hospital Association & Training School for Nurses' was established as early as 1910. 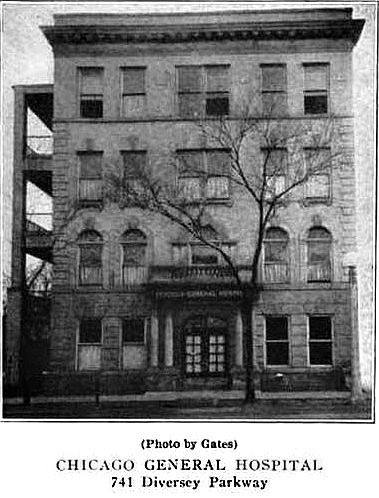 This building is currently used for residential living. 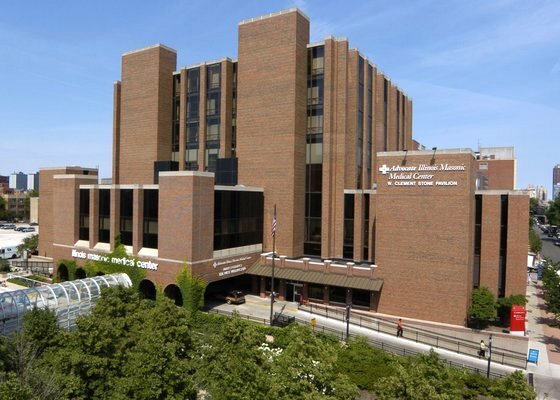 over $1000 per month as of 2016. 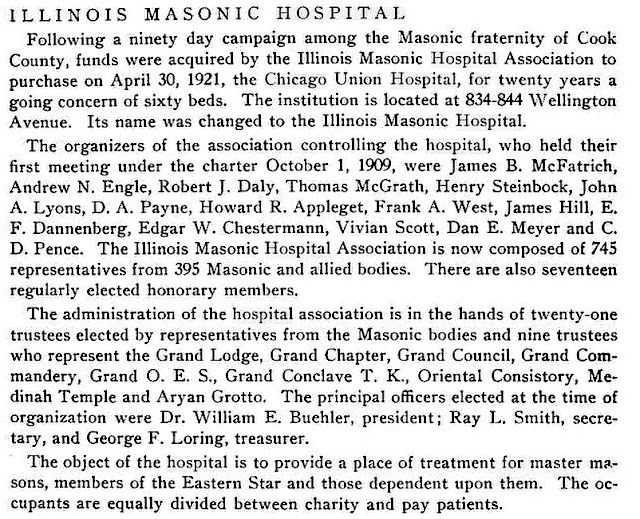 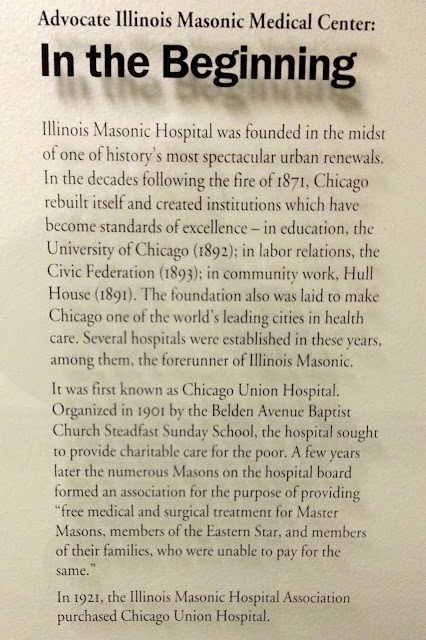 The original name was Chicago Union Hospital. 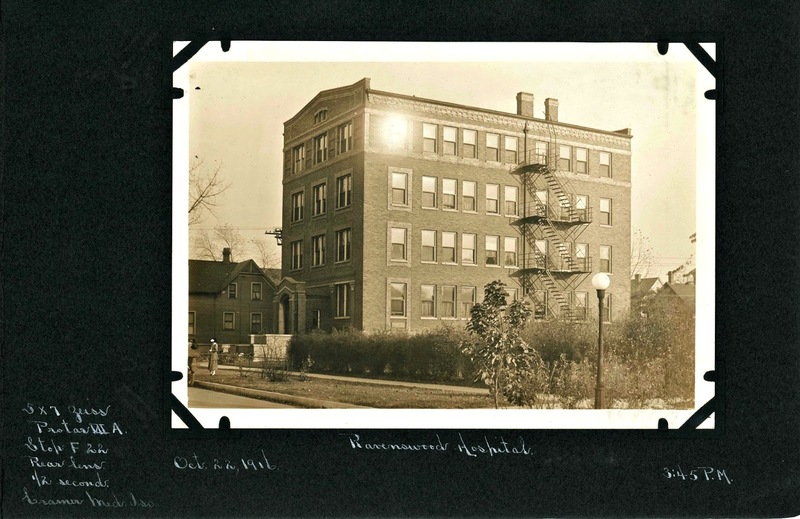 This facility was both a general hospital and training school for nurses. 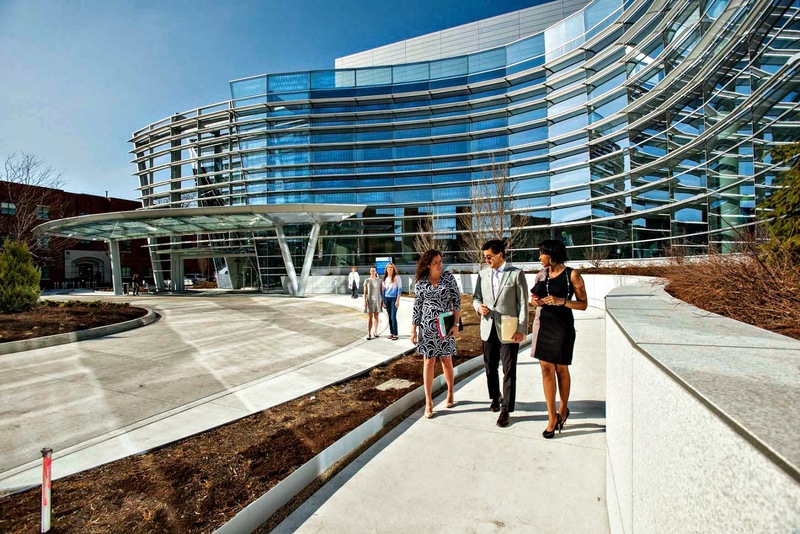 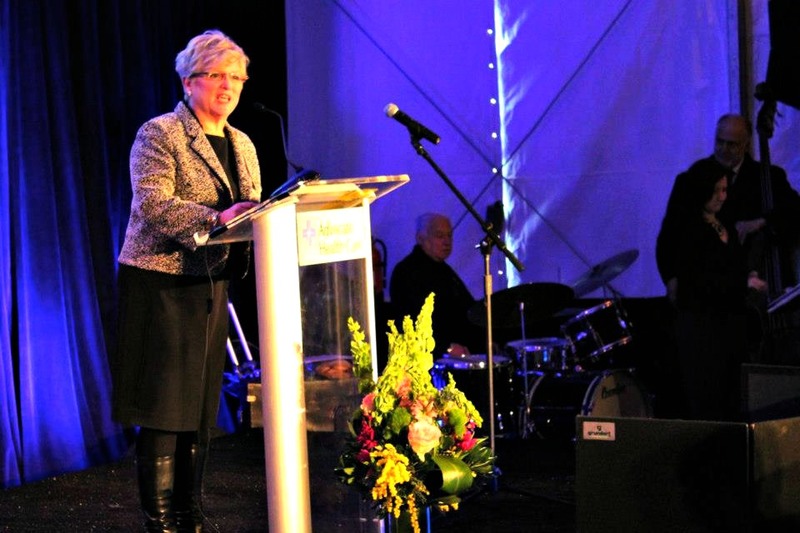 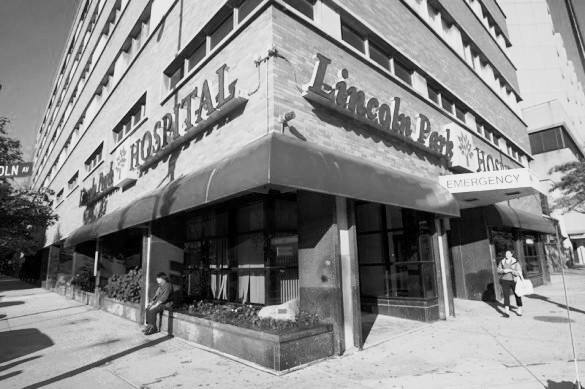 This institution is recognized for its care for lesbian, gay, bisexual, and transgender patients across the array of medical needs and emergency services. 2015 It's done and ready for business according to this link! 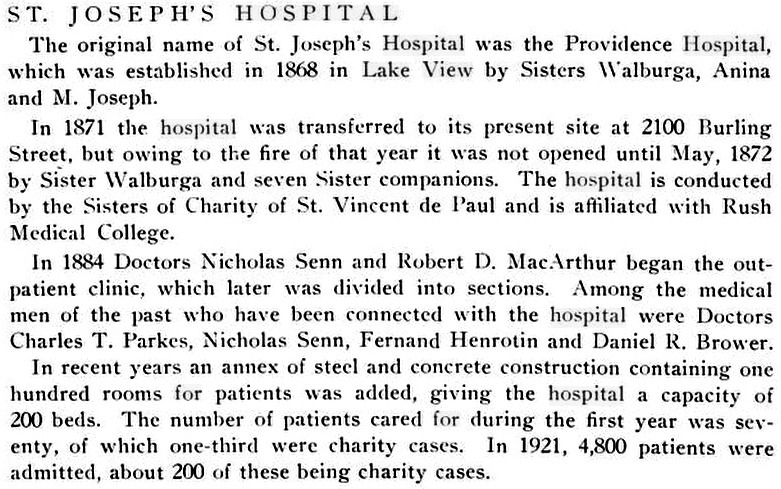 Saint Joseph Hospital. 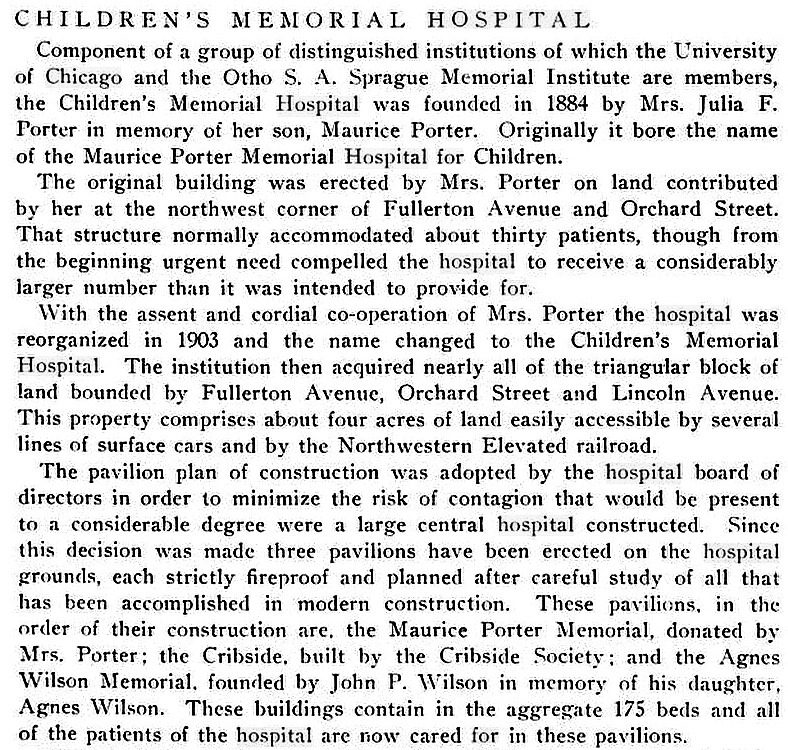 This organization also served orphans calling it the St. Joseph Provident Orphan Asylum located between Belmont Avenue and Diversey Parkway. 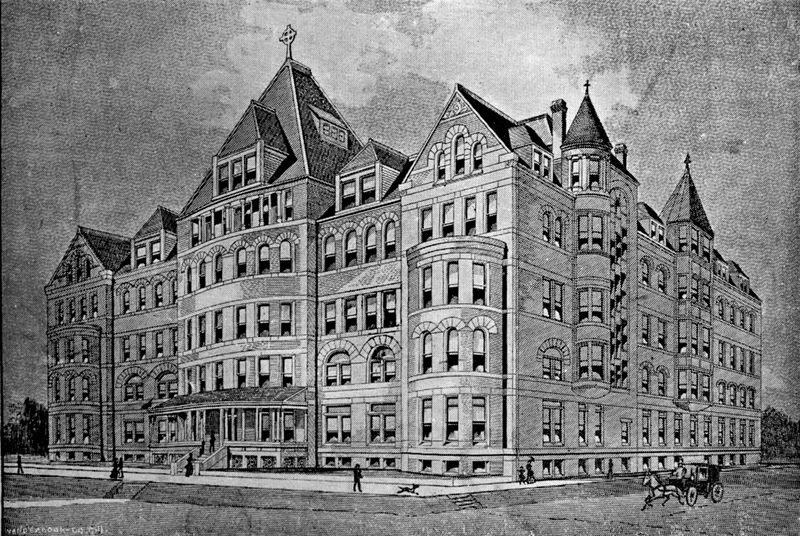 In 1893 The Saint Joseph School of Nursing, which was affiliated with DePaul University, opened on the Burling Street property. 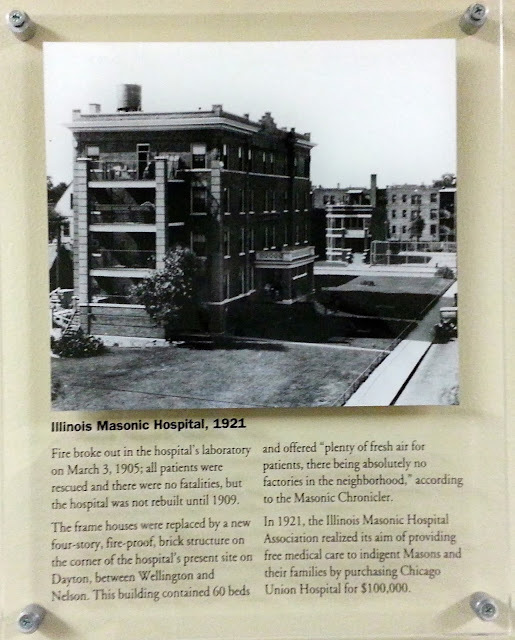 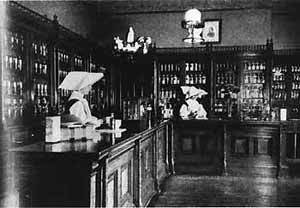 By 1894, inpatient and outpatient services in the hospital included surgery, medicine, pediatrics, obstetrics and gynecology, cardiac care and eye, ear, nose and throat treatment. 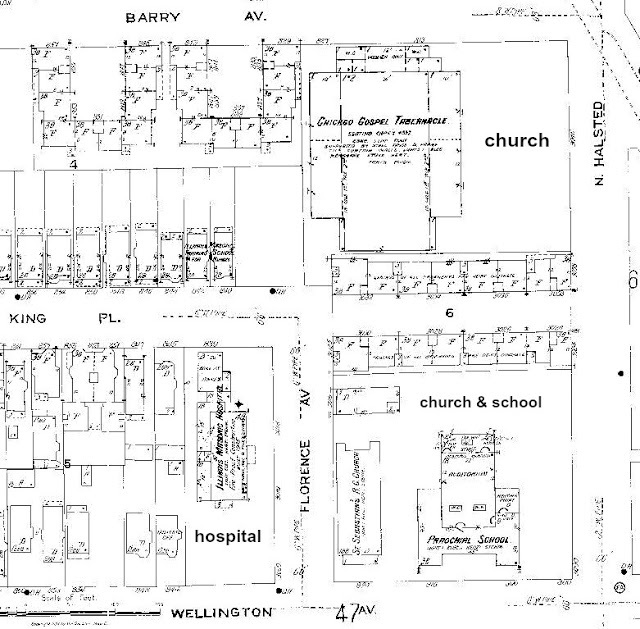 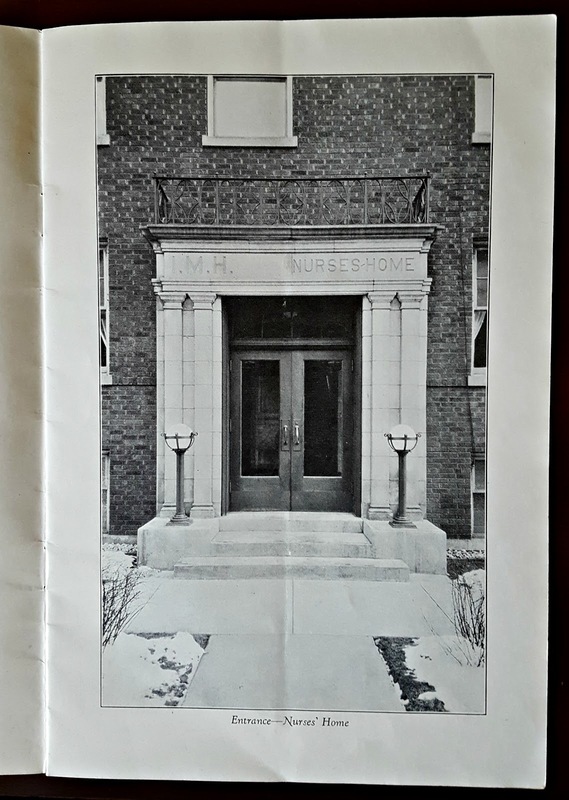 Some 1,504 nurses graduated from the school prior to its Burling Street closing in 1964. 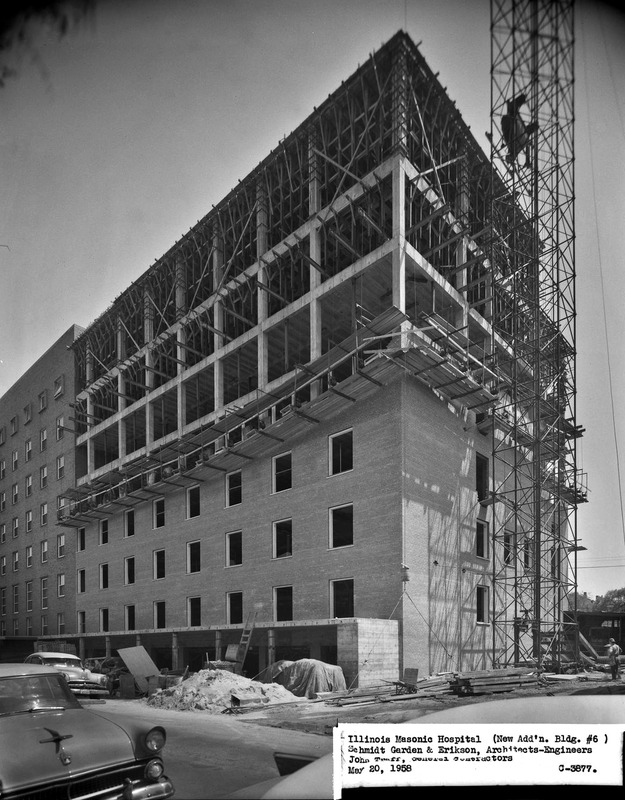 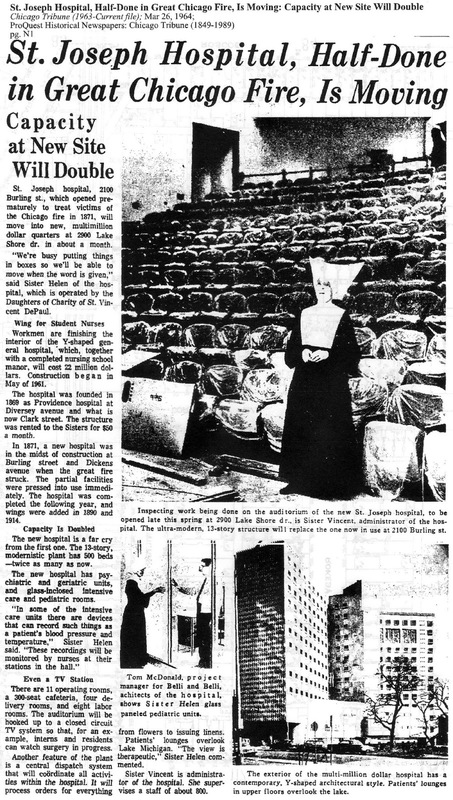 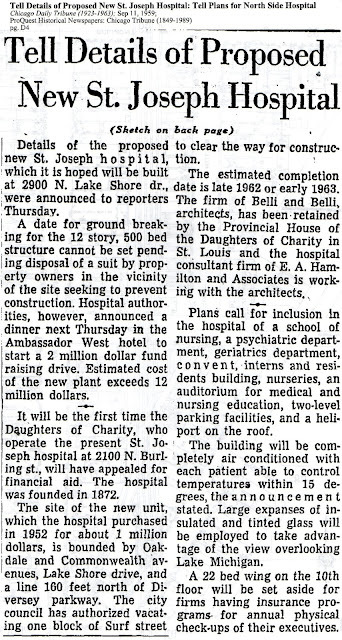 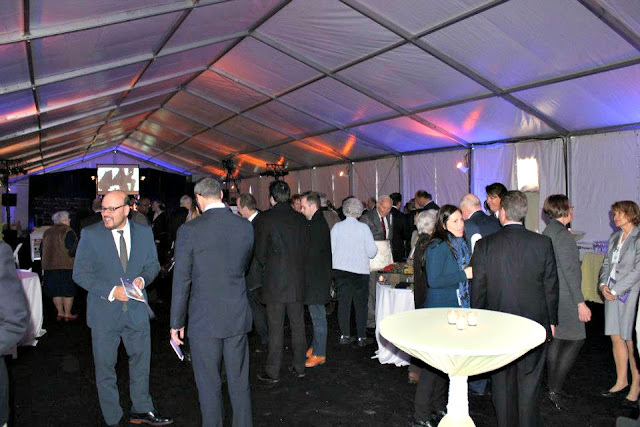 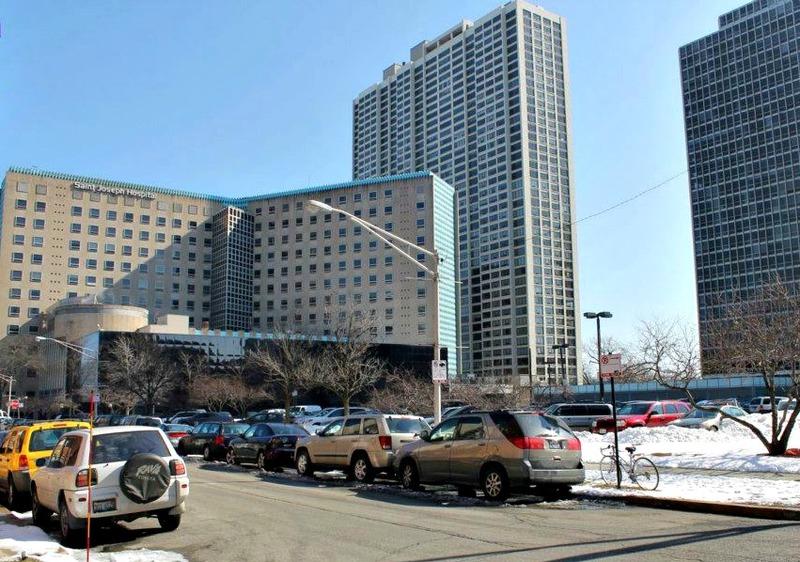 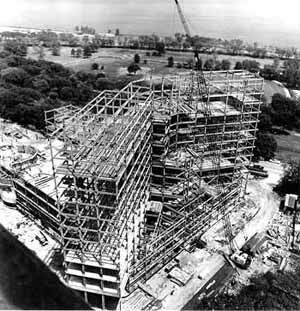 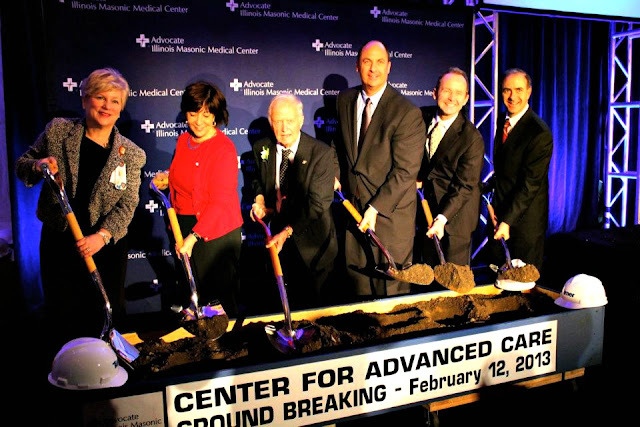 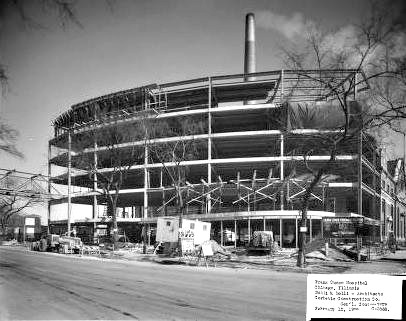 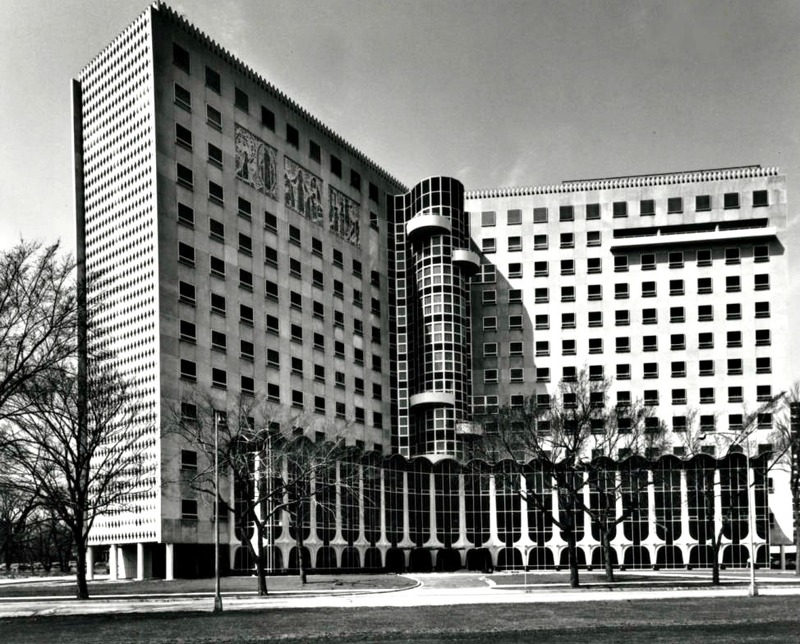 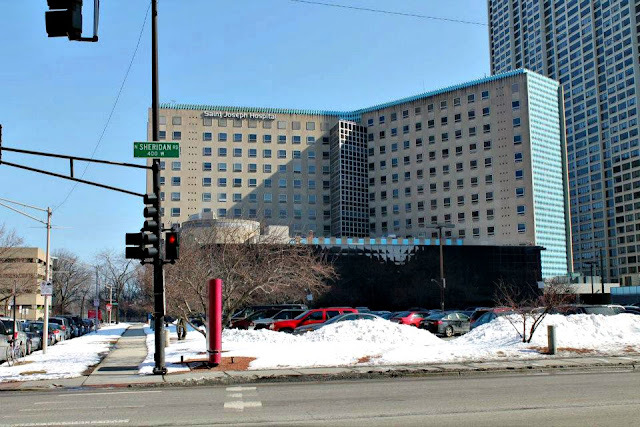 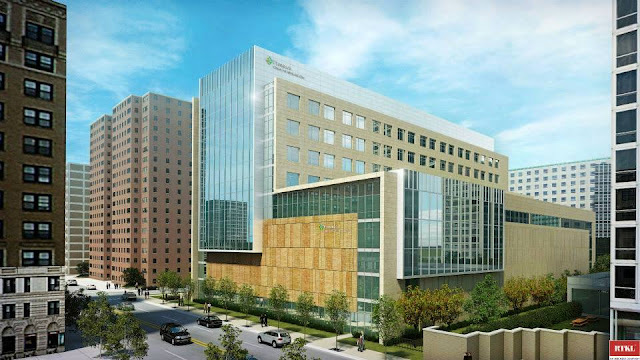 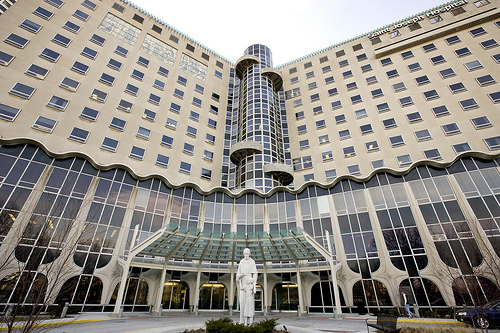 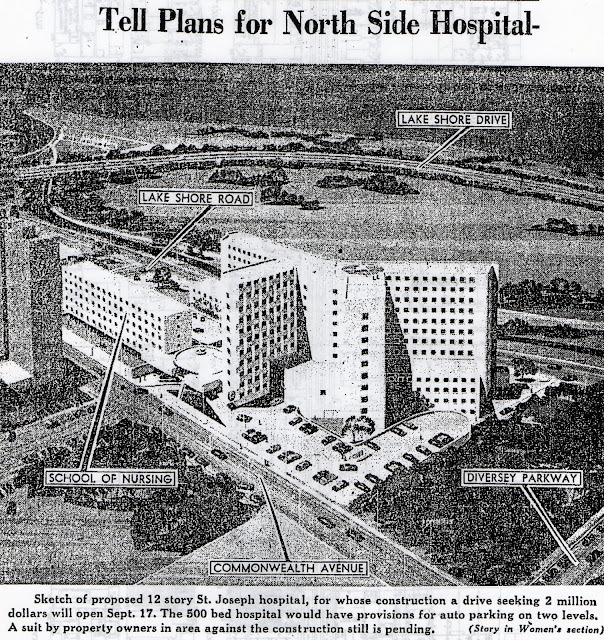 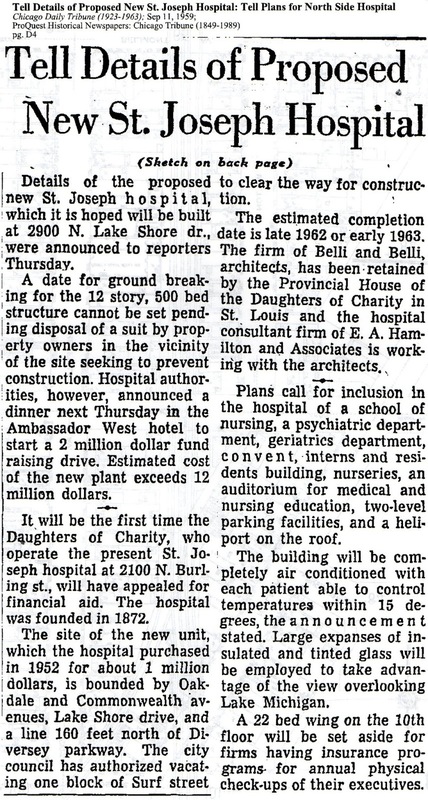 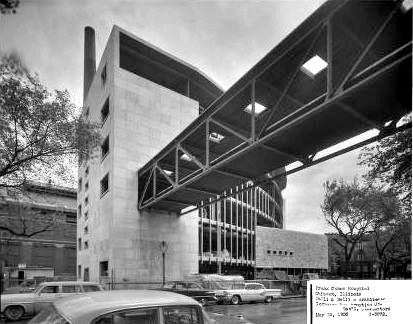 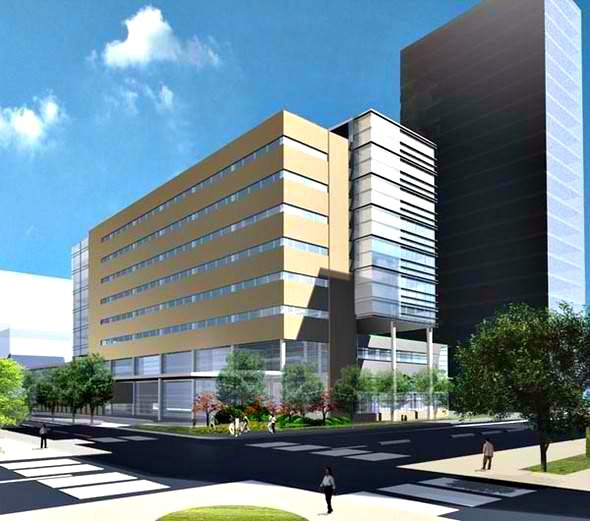 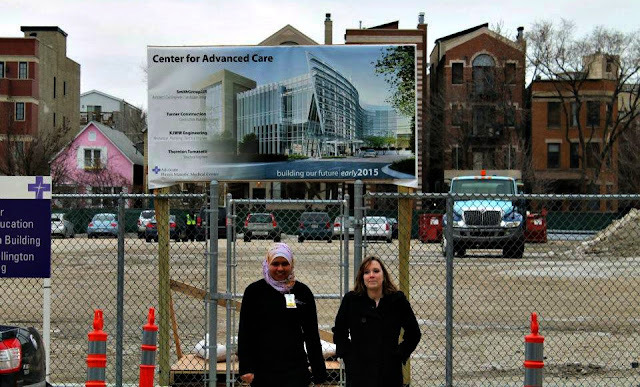 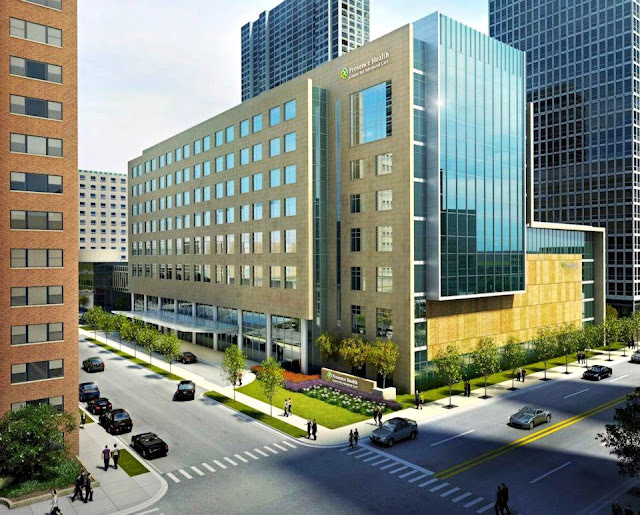 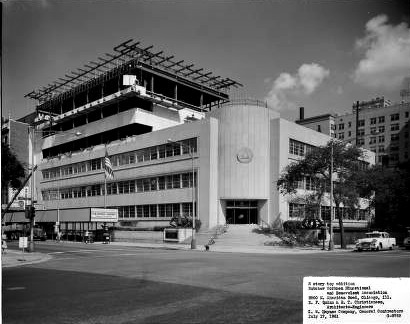 In 1964 patients and staff were moved into the new 500-bed Saint Joseph Hospital on its current site at 2900 LSD. 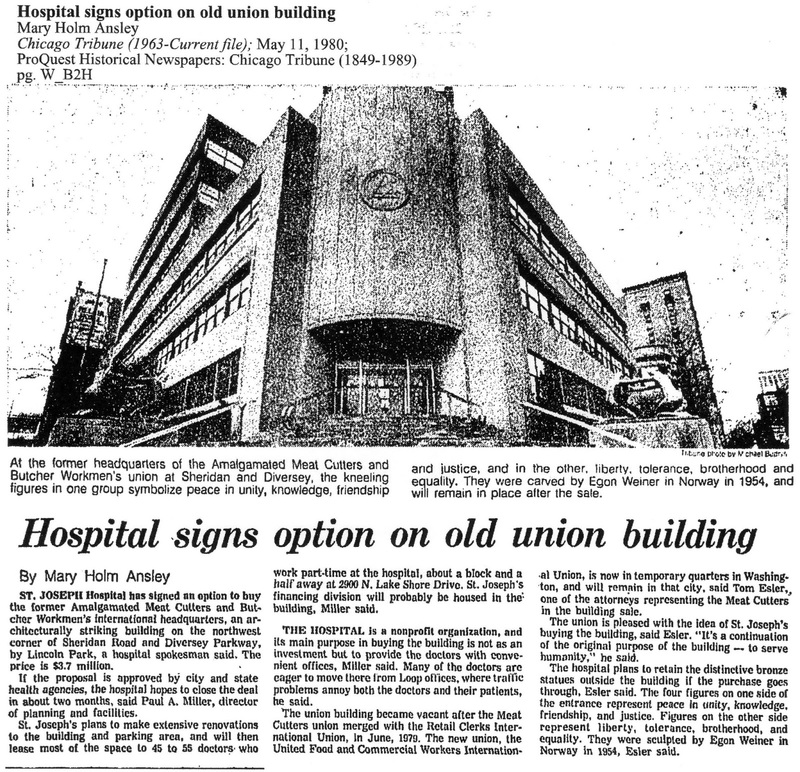 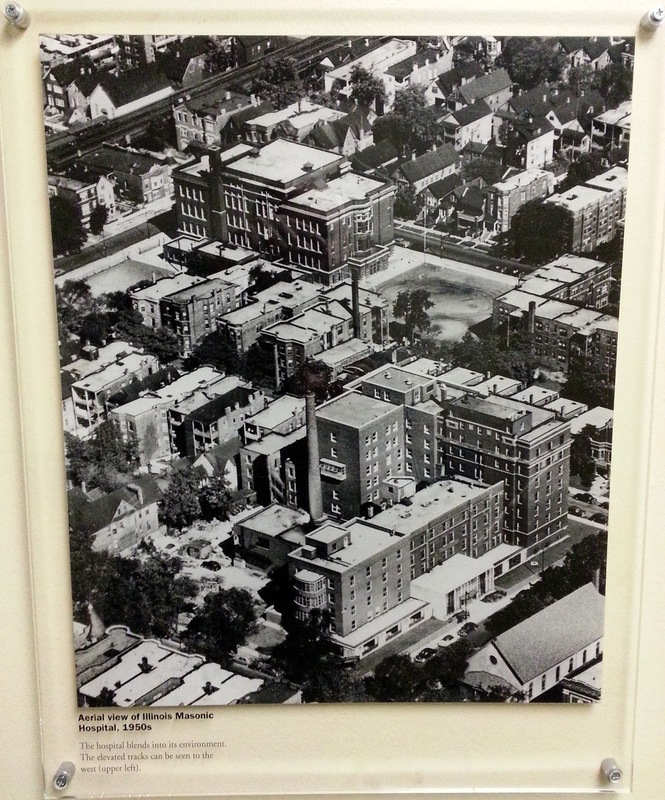 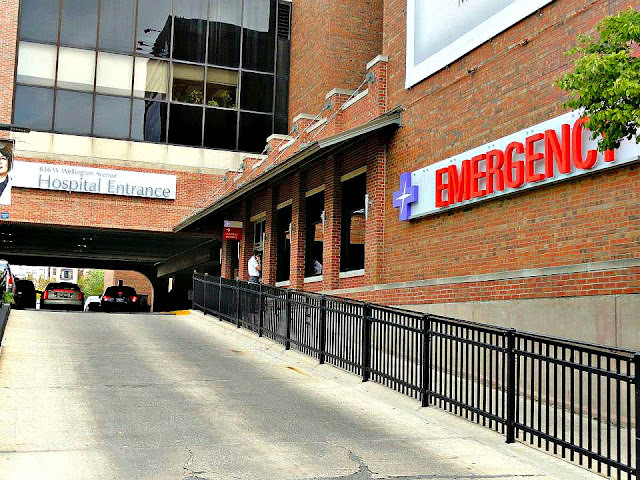 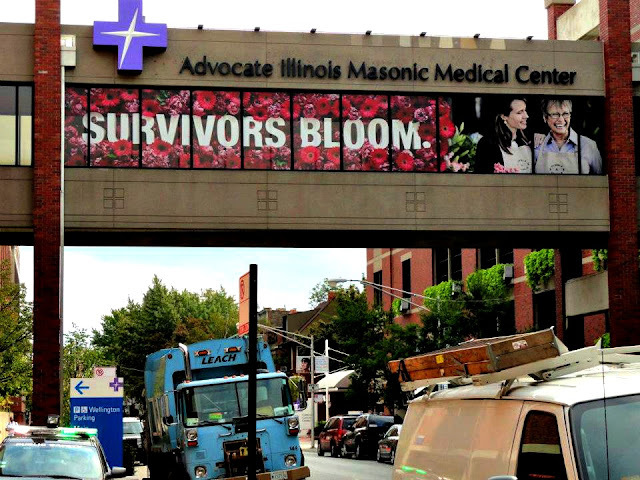 In 1995 Saint Joseph Hospital merged with Columbus Hospital & Saint Anthony Hospital in Pilsen/Little Village. 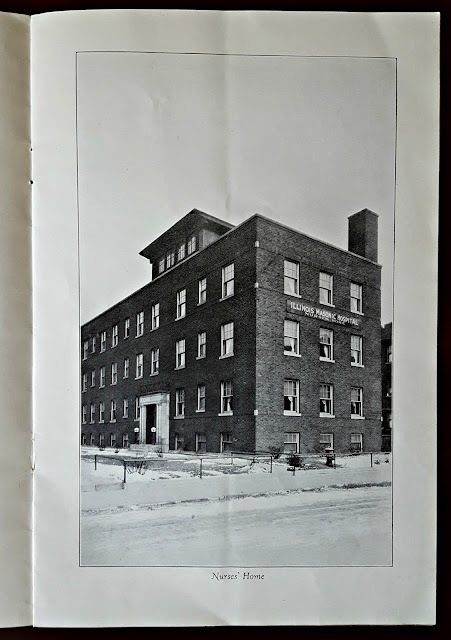 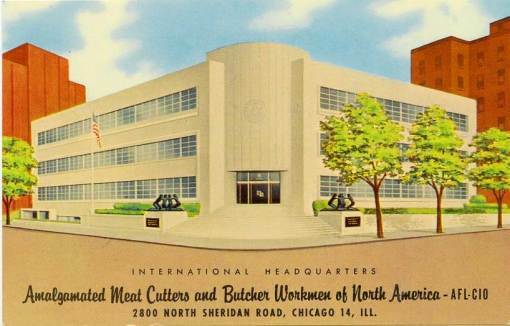 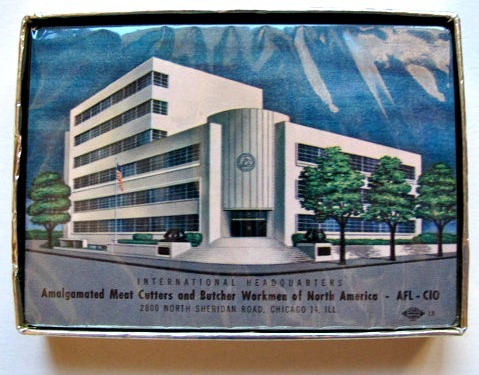 And across the street on the northwest corner of Diversey Parkway and Sheridan Road was once the Amalgamated Meat Cutters International & Butcher Workmen Headquarters that is presently used by the hospital as office space. 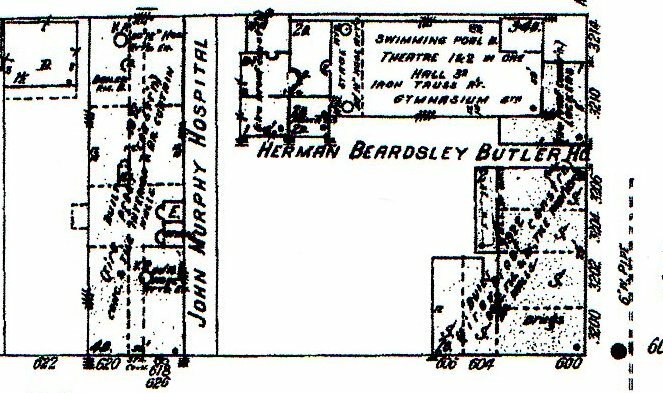 Stock Yards and meatpacking industry. 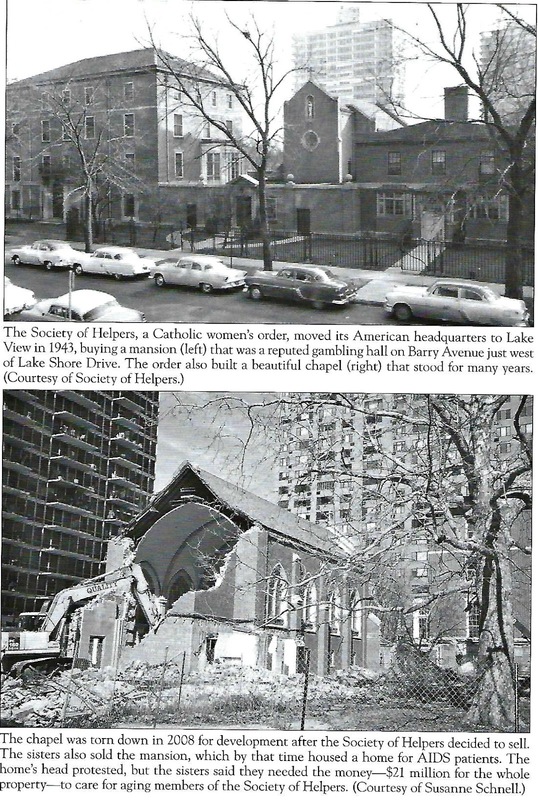 The building was sold to St. Joseph's in 1980. 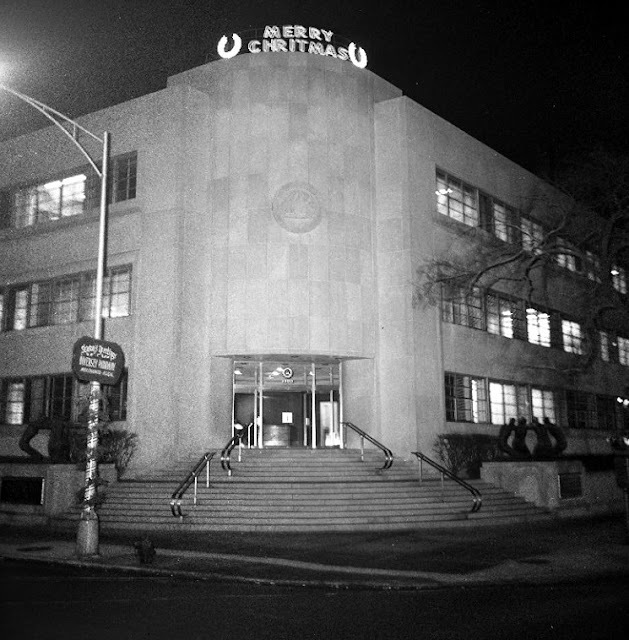 The building was vacant for about a year after the a new union was formed that united the Retail Merchants with Meat Cutters.